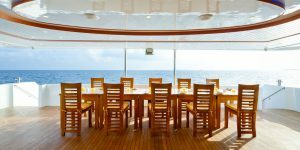 Posted on November 3, 2016 at 1:20 pm. 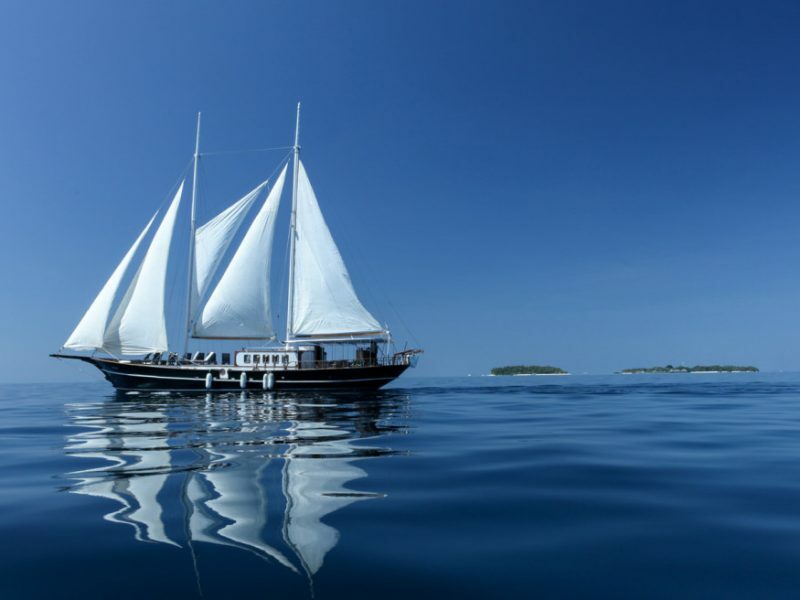 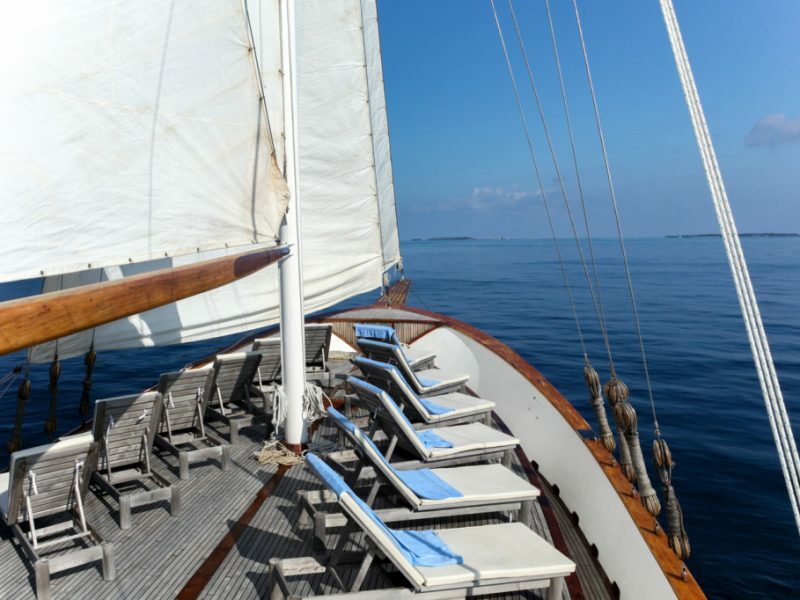 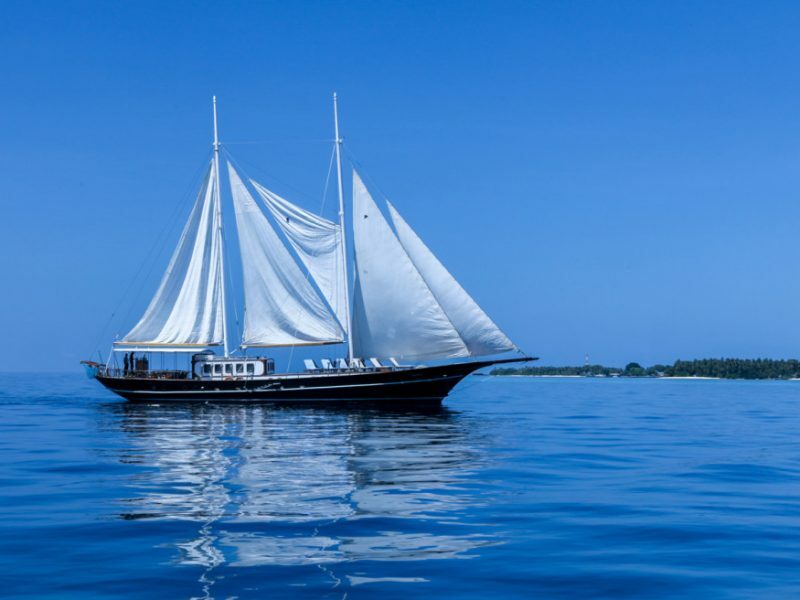 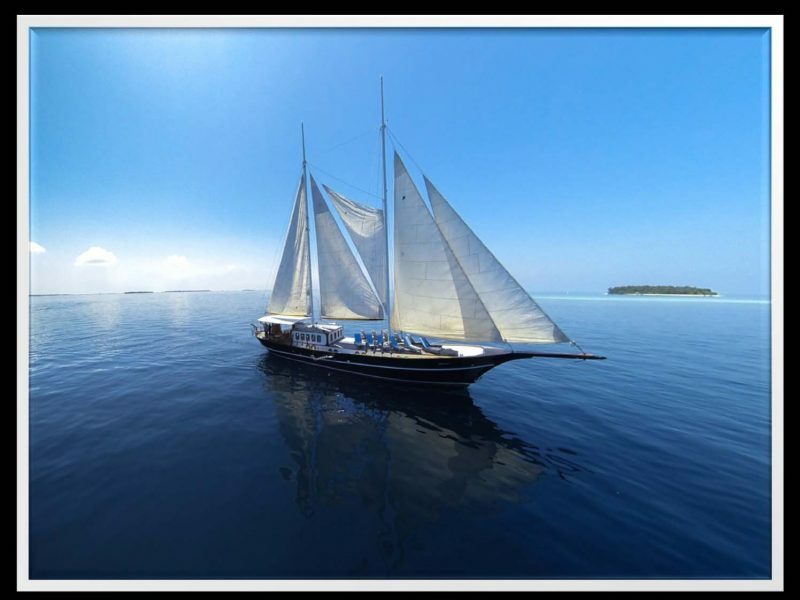 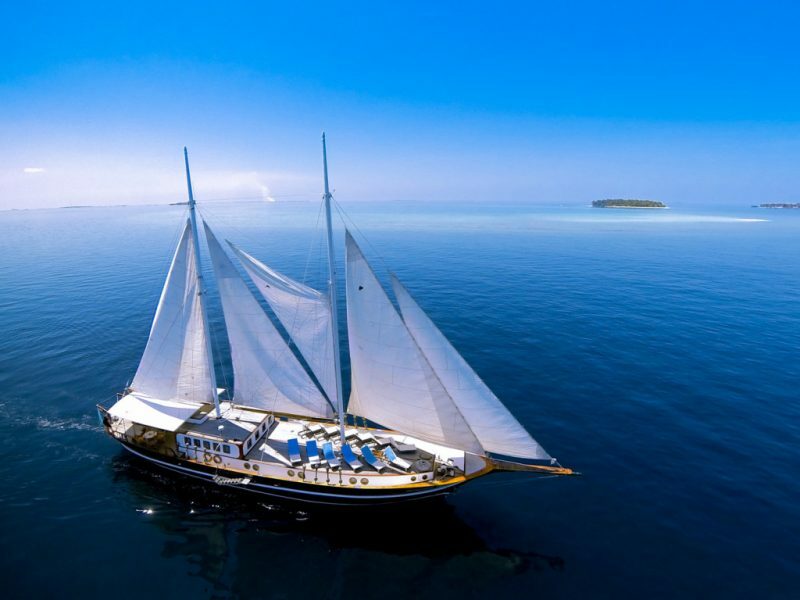 Dream Voyager is a classical two-mast and five staysail luxury yacht operating in the Maldives since year 2000. 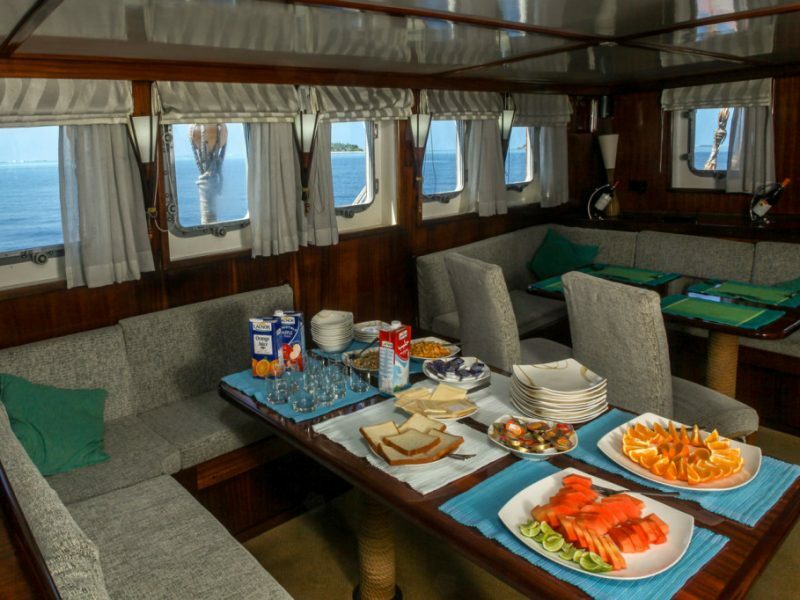 Built and designed in Turkey in the year 1999, this sailboat went through a thorough renovation in 2009. 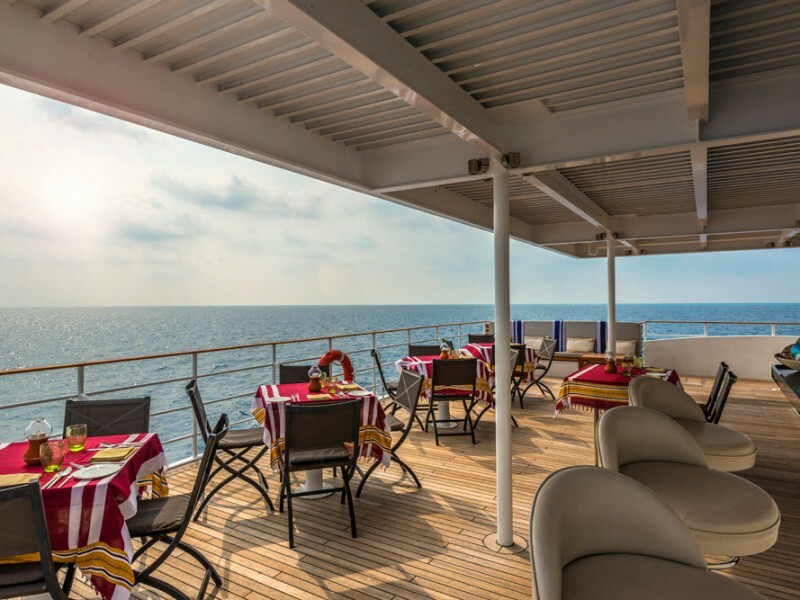 The entire floor deck have been replaced with a brand new teak wood and furnished with well-situated deck chairs, sun loungers and an awning. 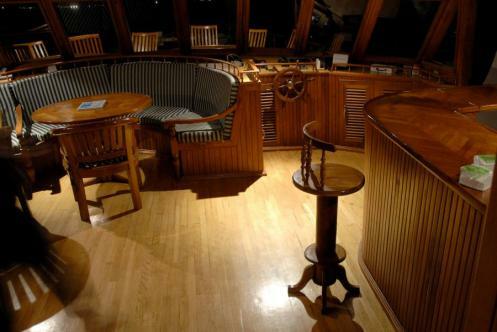 The interior of the boat is elegantly appointed with timber panels, a fully carpeted saloon flooring, three saloon tables, galley and a bar counter. 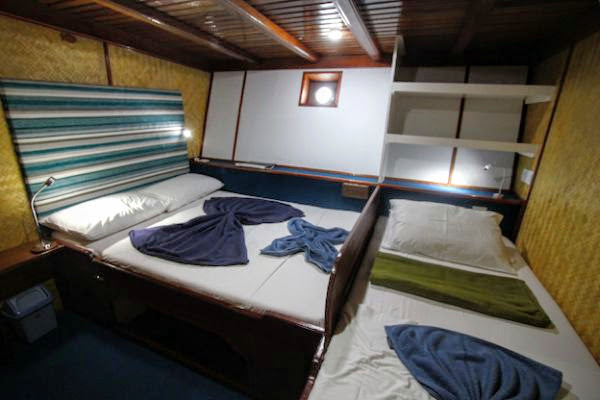 There are six fully air-conditioned double cabins with comfortable double bed, en-suite with shower and a WC. 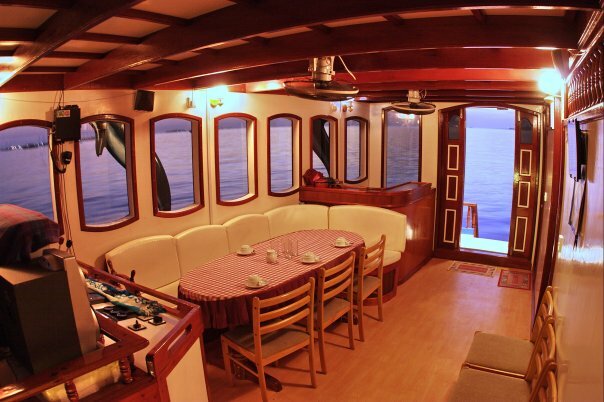 For your convenience Wifi access is also available all around the boat. 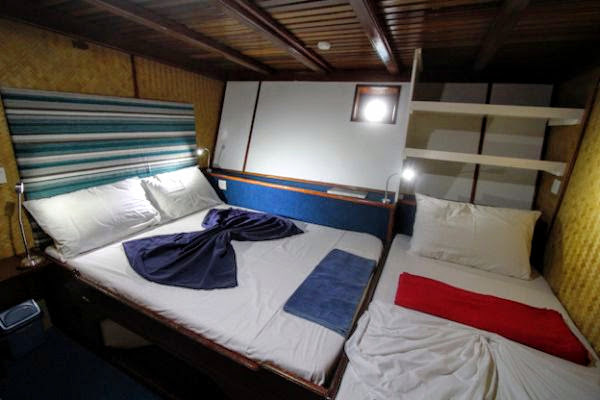 There are six fully air-conditioned double cabins with comfortable double bed, en-suite with shower and a WC.  Posted on November 2, 2016 at 2:14 pm. 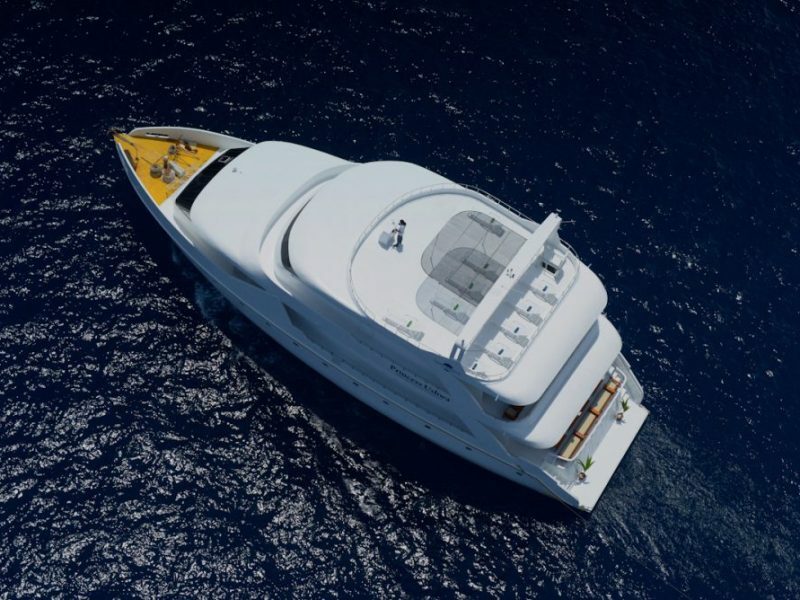 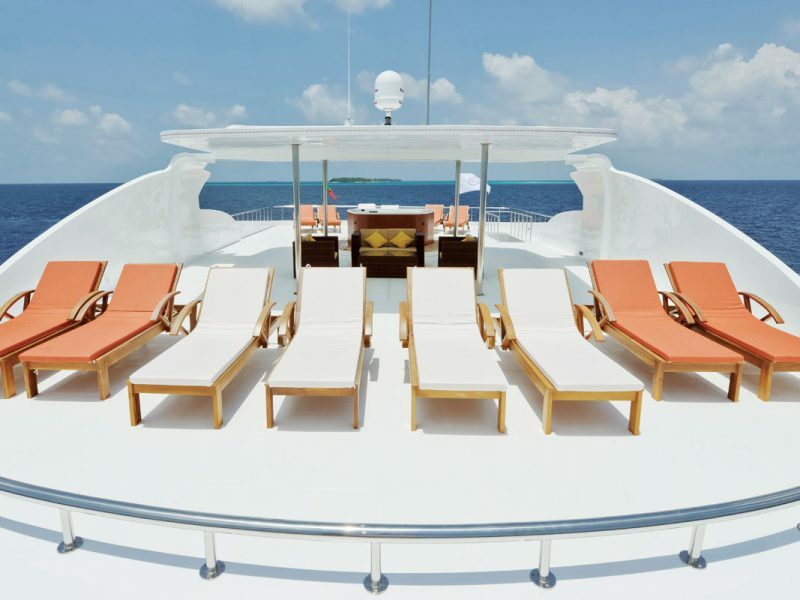 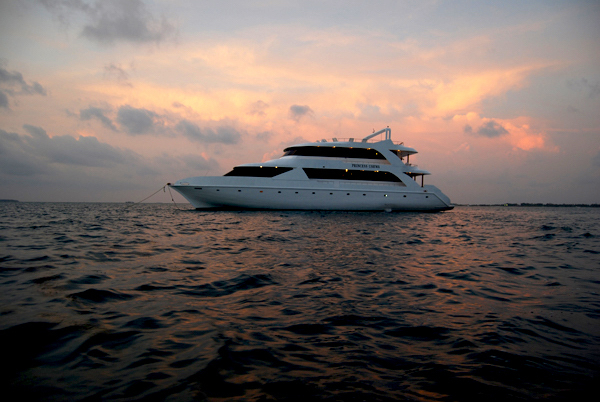 LEO Luxury Yacht takes sophistication and luxury to the high seas of the Indian Ocean, where design and atmosphere blend flawlessly with the breathtaking beauty of the Maldives. 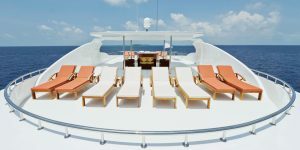 The magnificent 41 meter LEO Luxury Yacht caters to your every wish; if relaxation is your choice indulge at ZOSMA with rejuvenating spa treatments in absolute serenity or unwind in the Jacuzzi lounge, SKY, at our top deck basking in the glorious rays or gazing at the stars while sipping your favorite cocktail. 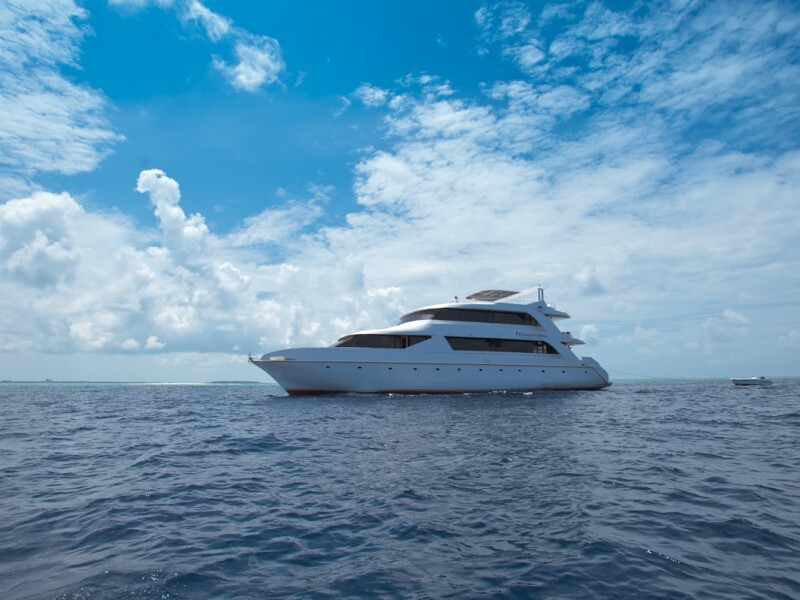 Prefer to add a hint of adventure to your stay?Explore the surrounding islands and underwater magnificence of the Maldives with the exciting range of activities offered onboard LEO, including diving, watersports, and excursions. 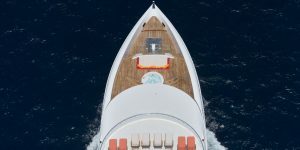 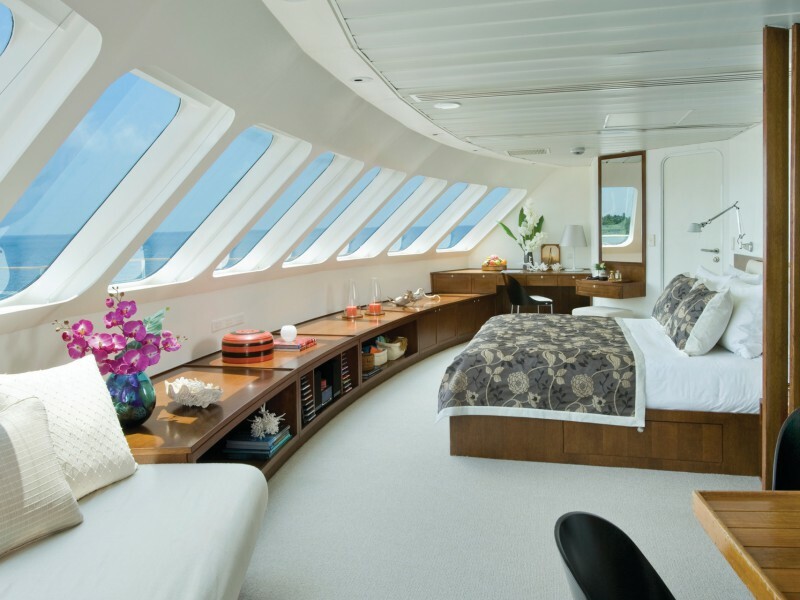 Elegance and style are evident throughout LEOLuxury Yacht with its charming décor and sensational experiences ensuring your stay is truly luxurious and cherished. 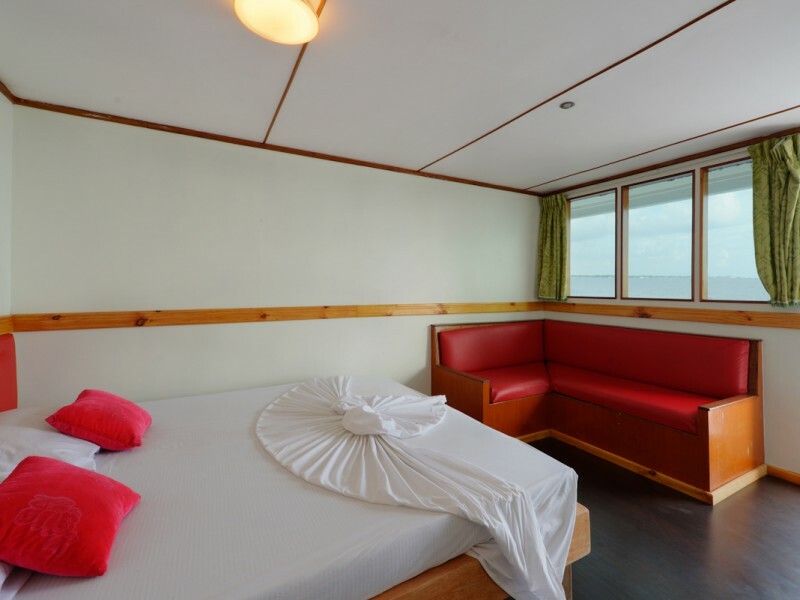 Sweeping views of the oceans coupled with peaceful serenity will greet you when you wake up at The Owners Cabin, one of LEO’s 9 cabins located at the upper deck, promising a heavenly start to your day. 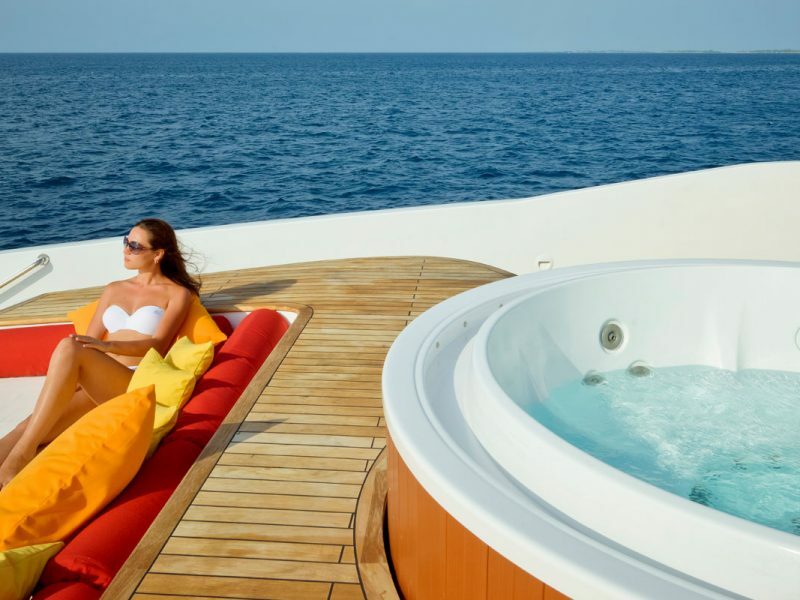 Enjoy life’s little luxuries at your own private Jacuzzi to ensure your day ends in ultimate indulgence and comfort. 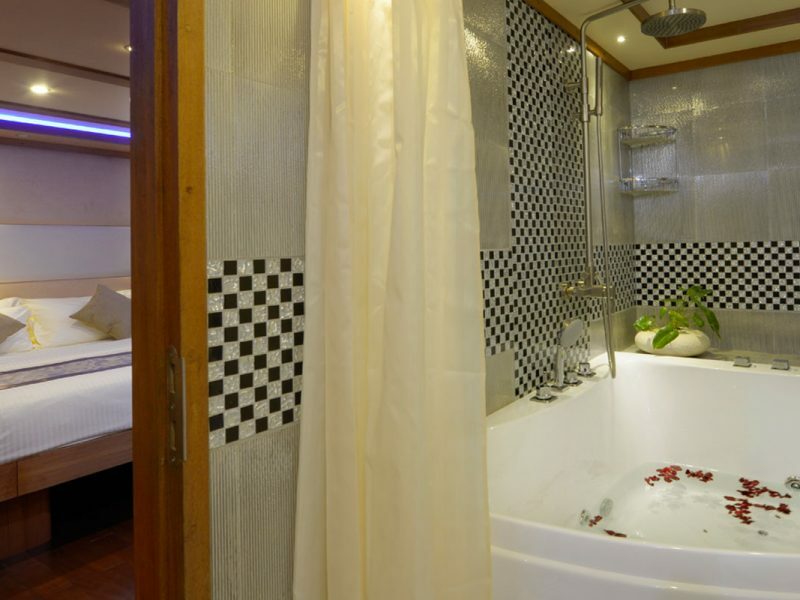 Unwind in your bathtub after a blissful day of sun and sea in your spacious Deluxe Cabin featuring classy decor and modern comforts enhancing your LEO experience. 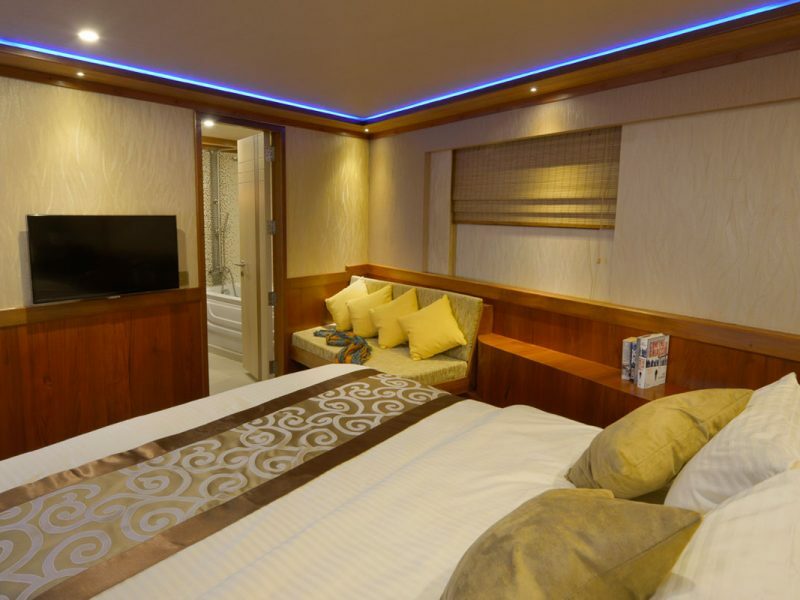 Reminisce your excitement of the day with your family and friends sharing your magical experience with you, at the comfort of your double or triple Cabins ensuring your travel companions are never too far away throughout your treasured journey onboard LEO Luxury Yacht. 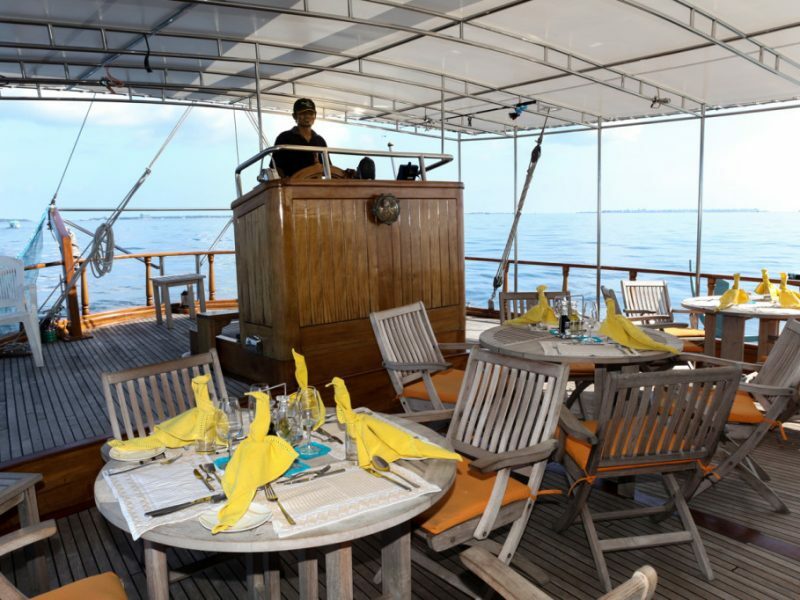 Be mesmerised by the soothing sounds of the waves complemented with enthralling views of the rippling ocean while appreciating the finest gastronomic experiences capable of pleasing the most discerning palates served atOCEAN Restaurant. 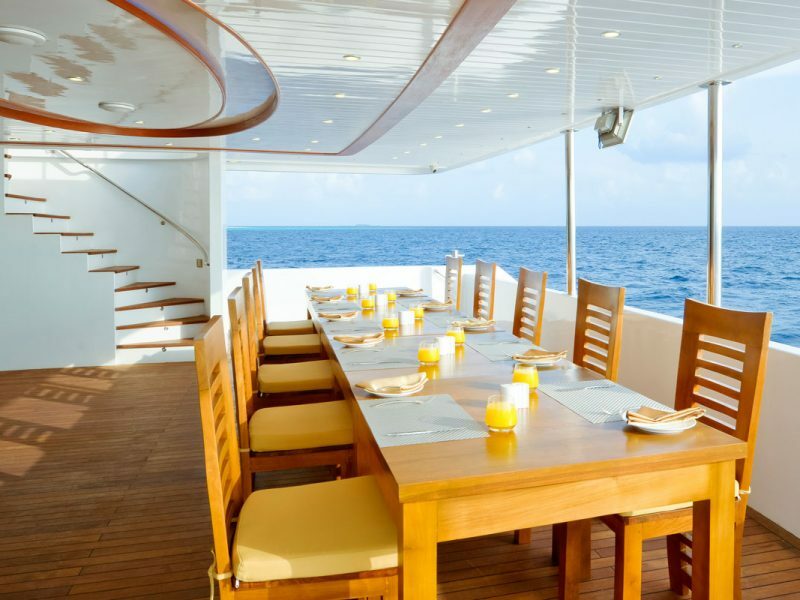 Dreaming of indulging in delectable cuisine within a magical setting while the stars shine right above you? 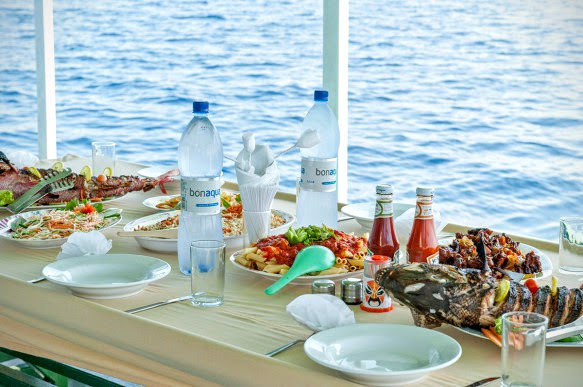 Candle-lit dinners and barbecues on a desert island or sandbank stumbled upon on your journey arranged especially for you will make for a truly unique dining experience, turning your dreams into a reality. 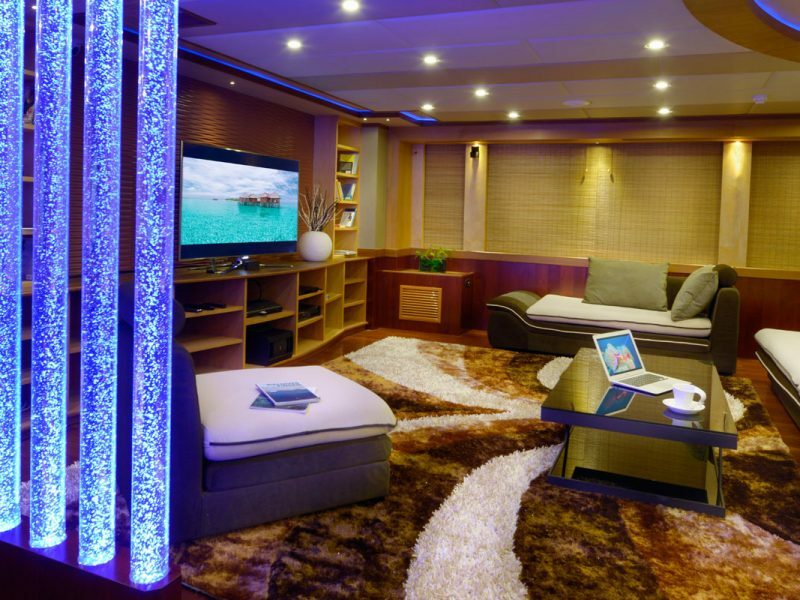 The Chill out Lounge, Library and HD Cinema. 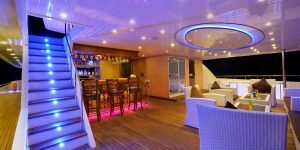 Liven things up at the ultra-trendy The ONE at the upper decks, by mingling with the guests in a lively atmosphere with our special selection of cocktails and canapé’s or sit back with a glass of wine and witness an incredible Maldivian sunset with a myriad of fascinating colours bursting upon the sky. 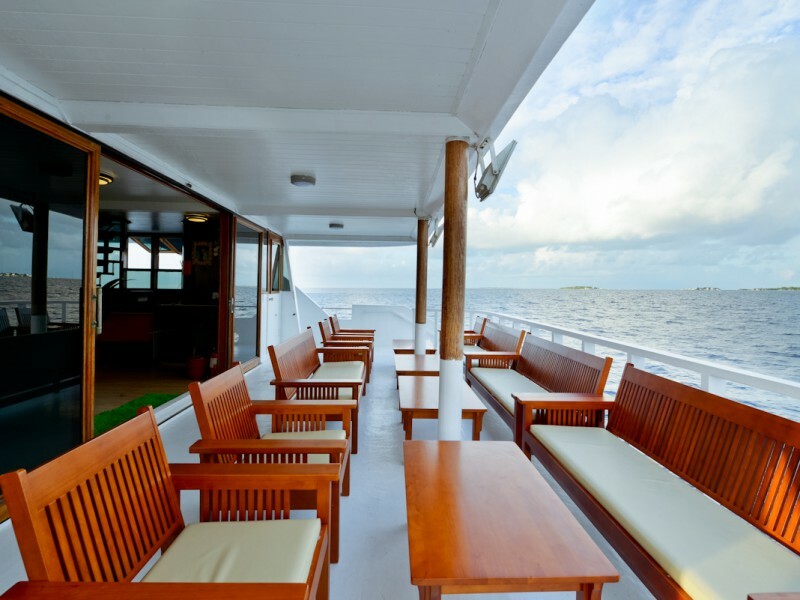 Lie back and feel the warm tropical sun on your skin and the gentle breeze comb through you hair at the relaxing sun pads at BREEZE, the spacious outdoor lounge at the upper decks. 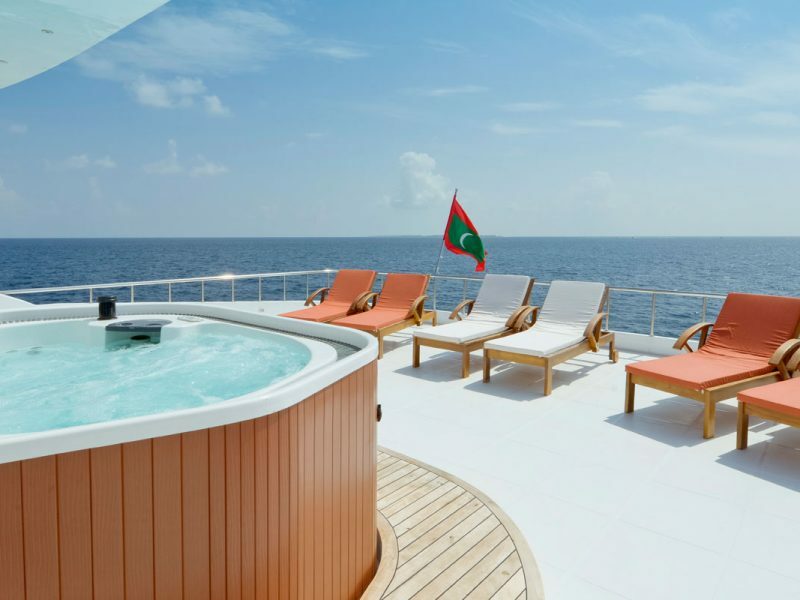 The Jacuzzi awaits for a dip to cool off while enjoying a refreshing cocktails, making BREEZE the perfect spot to sunbathe against a backdrop of pure tropical bliss. 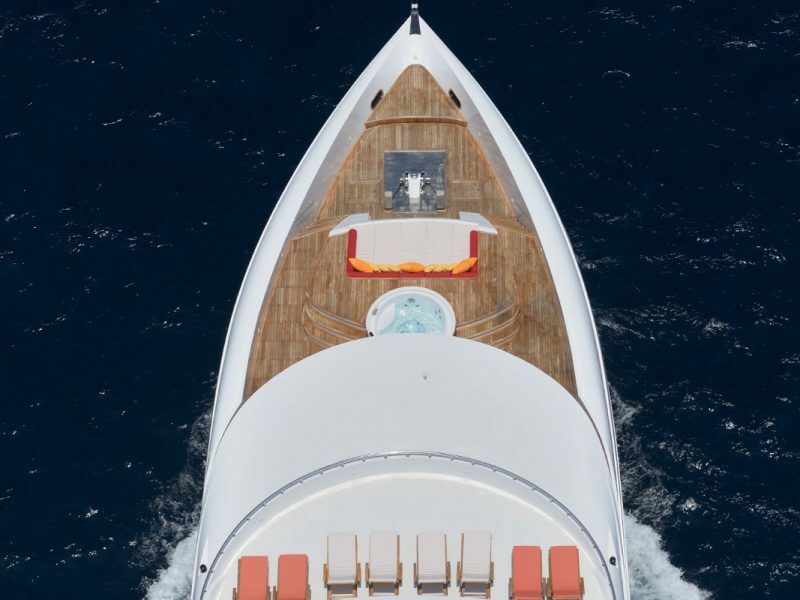 Sweeping views of the serene seas and skies highlights the treatment rooms at ZOSMA, the on board spa, designed to enhance your indulgence to sustain tranquility of body and mind. 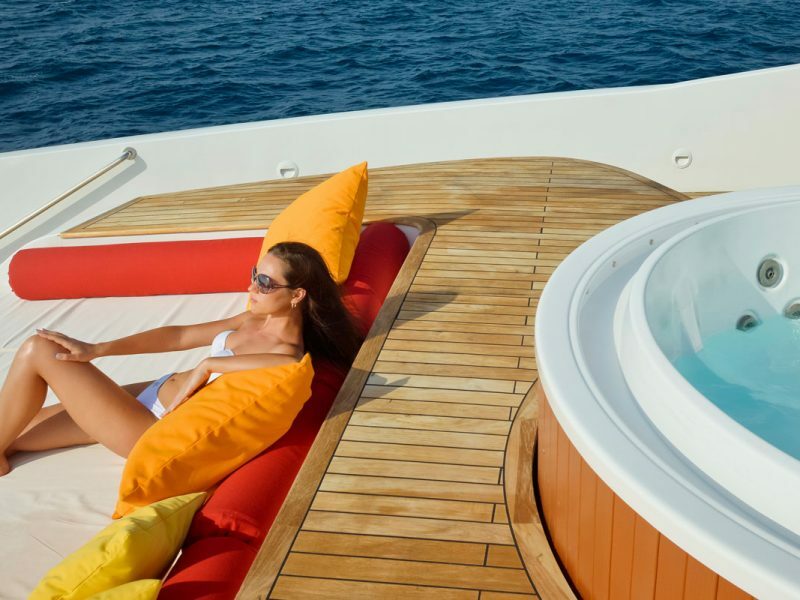 Steam off in the sauna rooms on the upper deck or immerse yourself in the top deck Jacuzzi at SKY lounge, to top off your rejuvenating spa treatment to complete your truly idyllic experience. 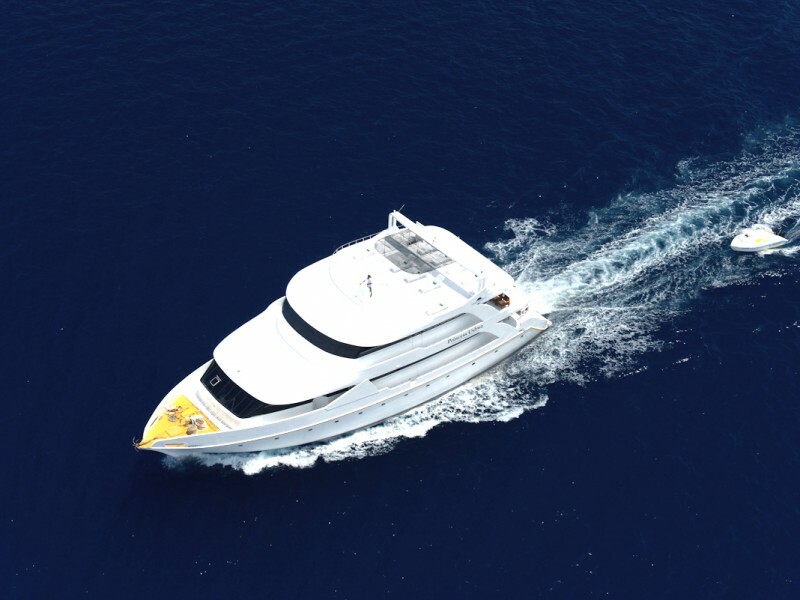 Take your LEO Luxury Yacht experience to an exhilarating level by whizzing past the turquoise waters on a Jet Ski or wakeboard. 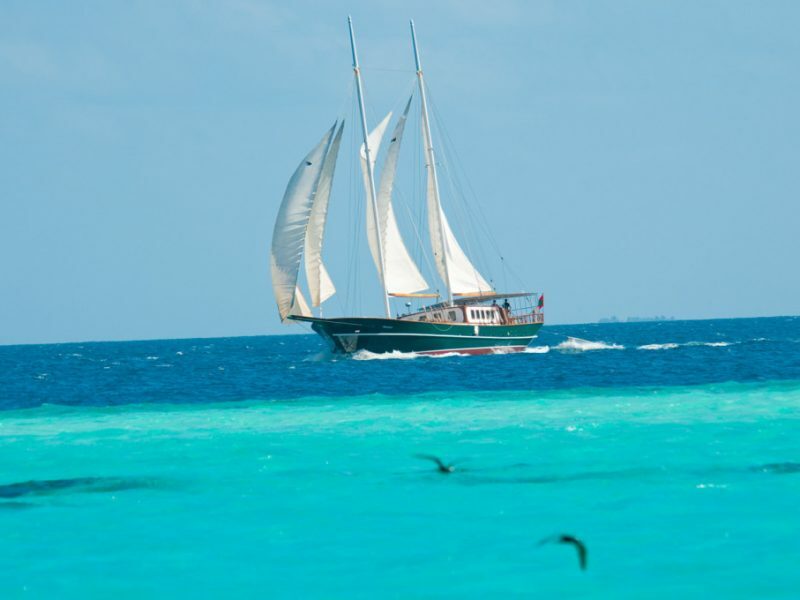 Glide through the crystalline waters by windsurfing or let big game fishing be your choice of activity to curb your sense of adventure and excitement. 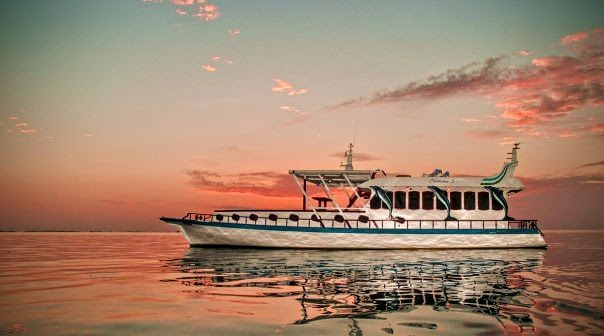 Explore one of the most famed diving locations in the world and prepare to be delightfully surprised by mantas, turtles and even whale sharks at times. 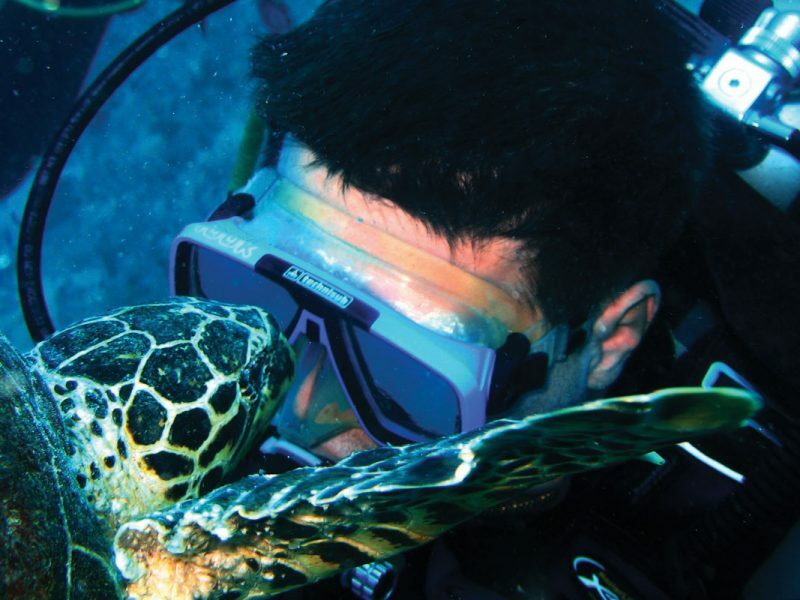 Please your inner adventure enthusiast and add more excitement to your diving experience with a hint of Nitrox as well. 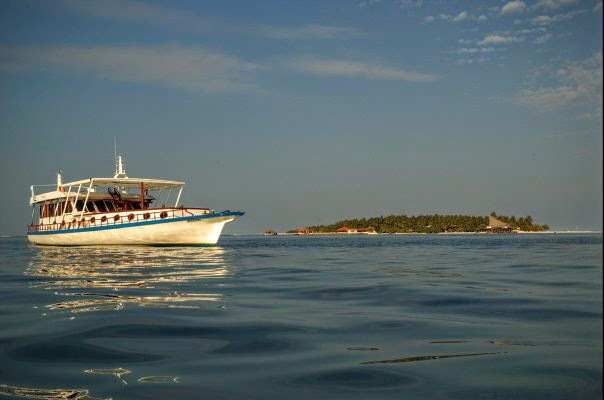 Wish to discover the vibrant coral reefs and exotic marine life in a more relaxed pace? 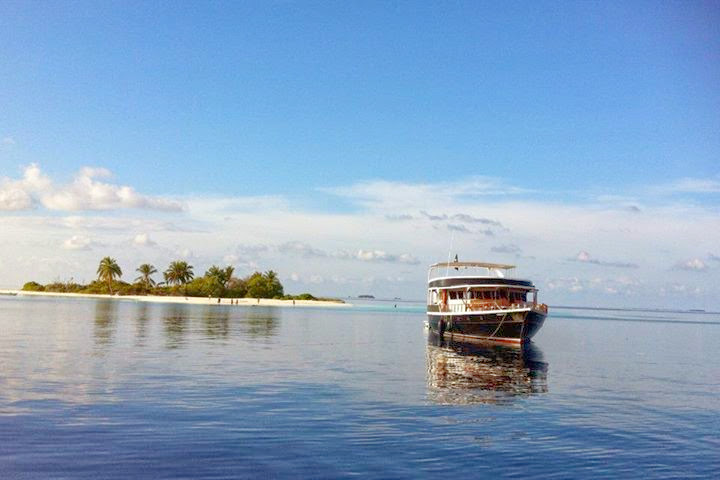 Snorkel through the crystalline waters and witness true beauty guaranteed to take your breath away. 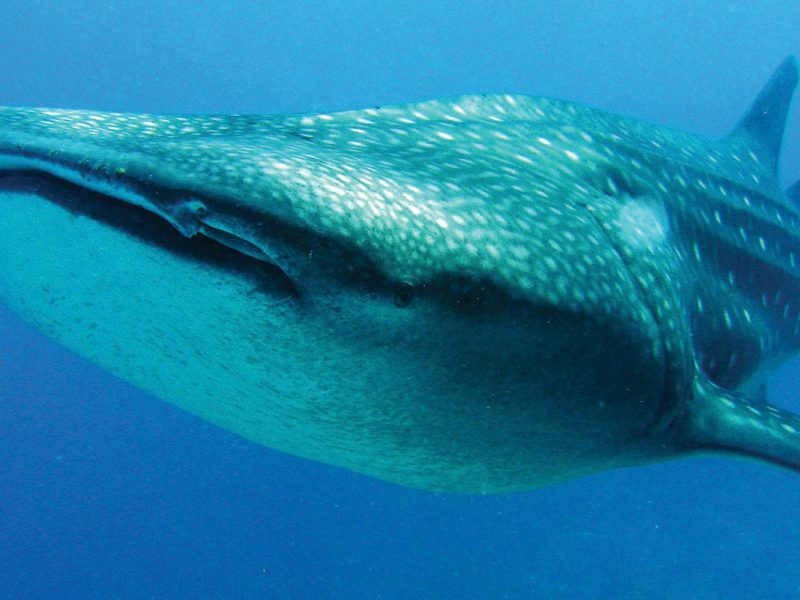 Posted on April 18, 2016 at 6:45 pm. 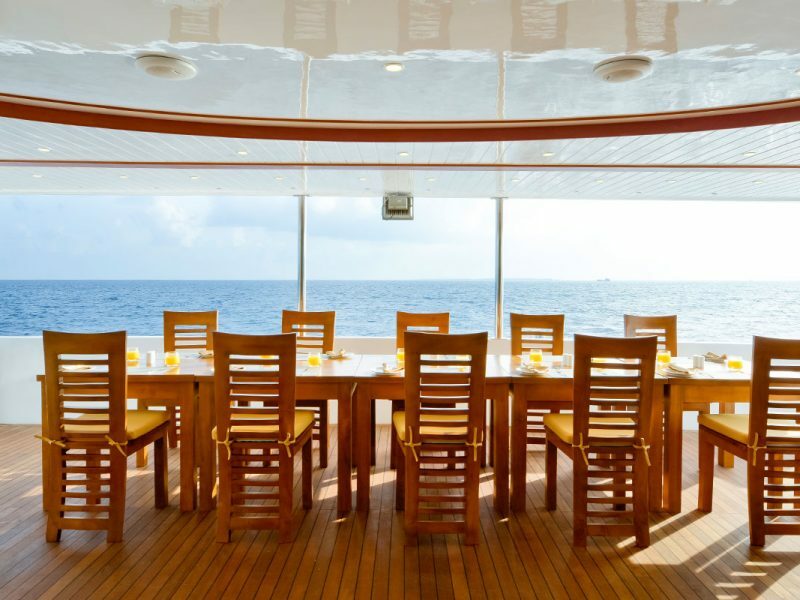 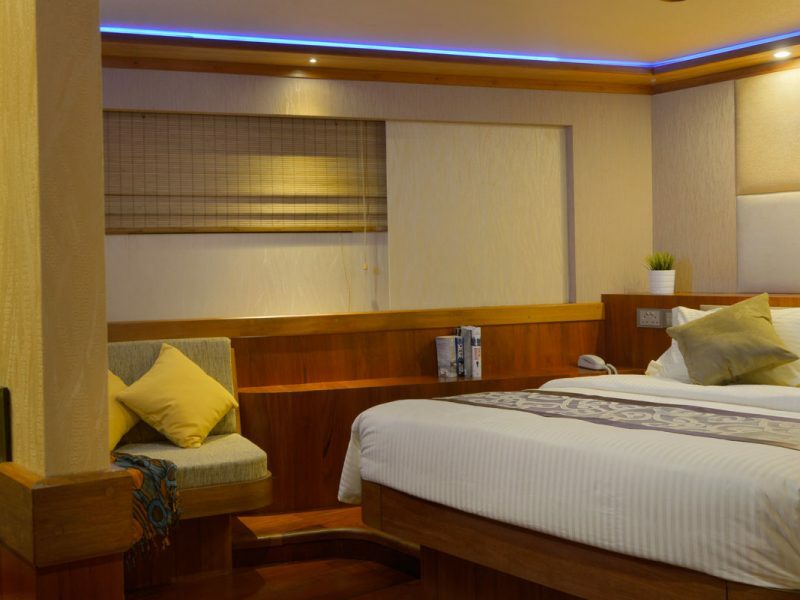 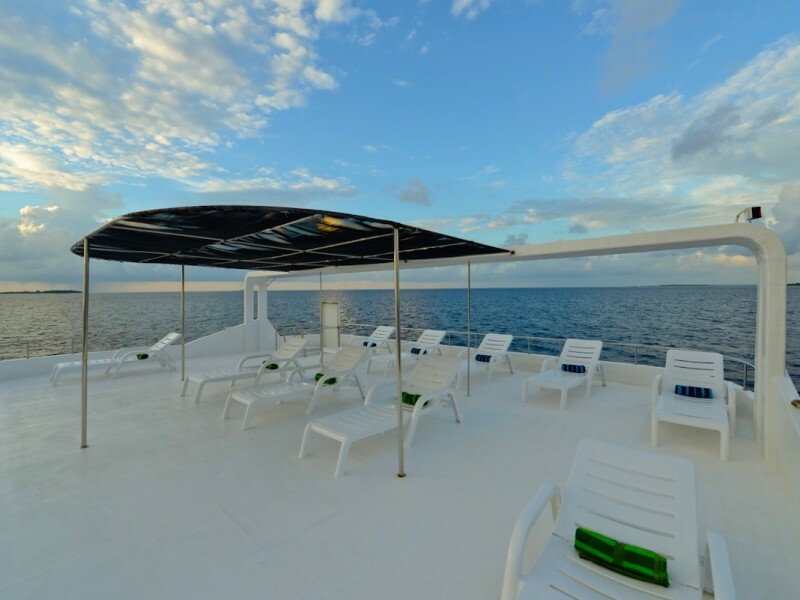 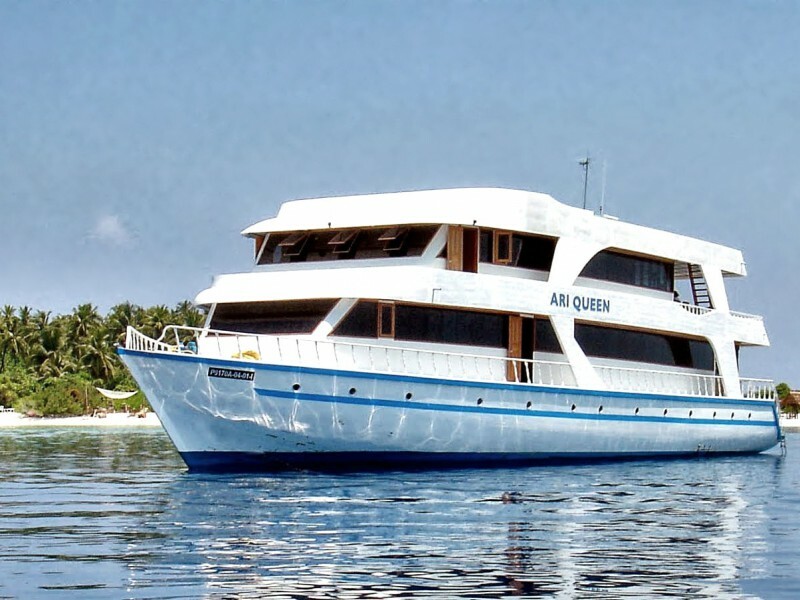 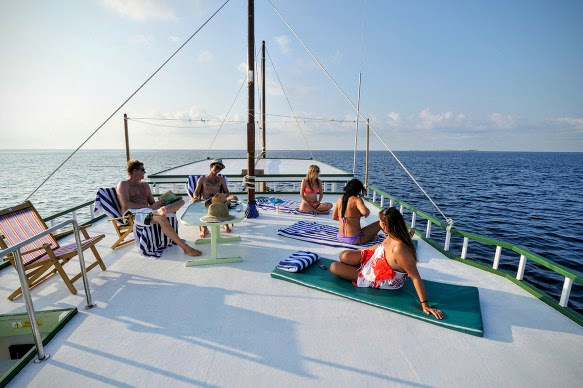 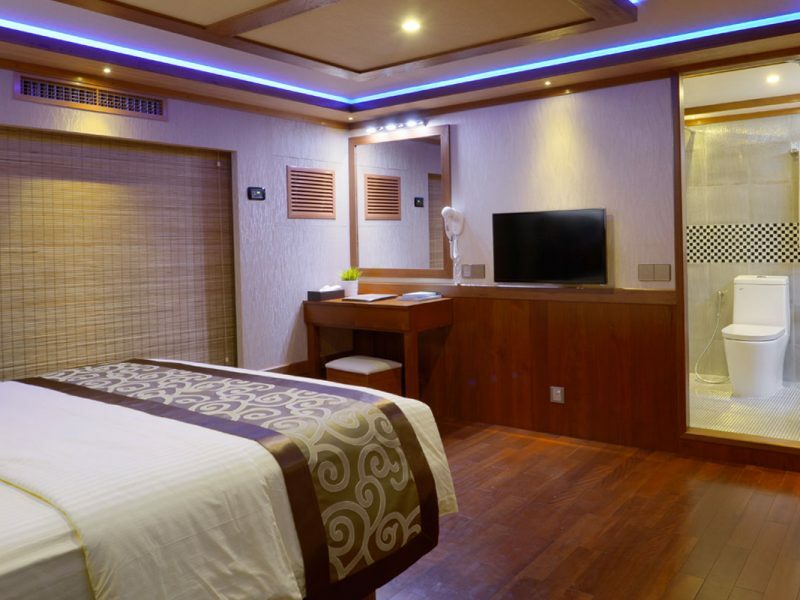 The MV Sea Spirit is a spacious liveaboard vessel that offers comfortable accommodation together with the high standard of service, offering an exciting and varied schedule of departures encompassing the very best of Maldives Diving. 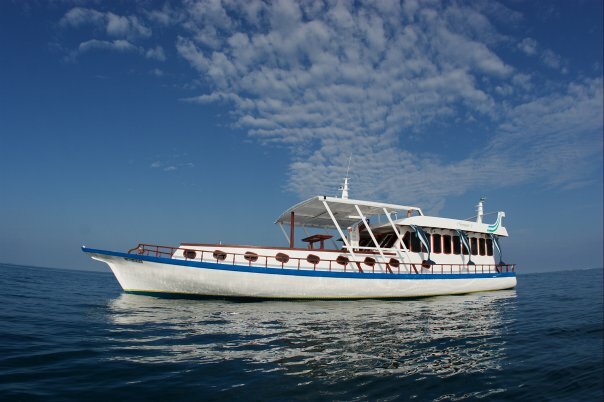 There are huge advantages to diving on a boat that takes only a small number of passengers – it is so much less intrusive to marine life when twelve divers jump into the water rather than twenty five, so you as a diver will have a much better opportunity to come close up to those elusive species you have been hoping to see. 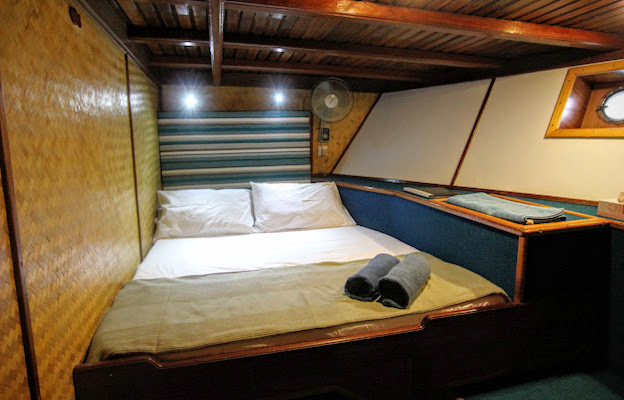 Of course, add to that the more personal service and attention to detail both on board and in the water, and you have an ideal liveaboard experience. 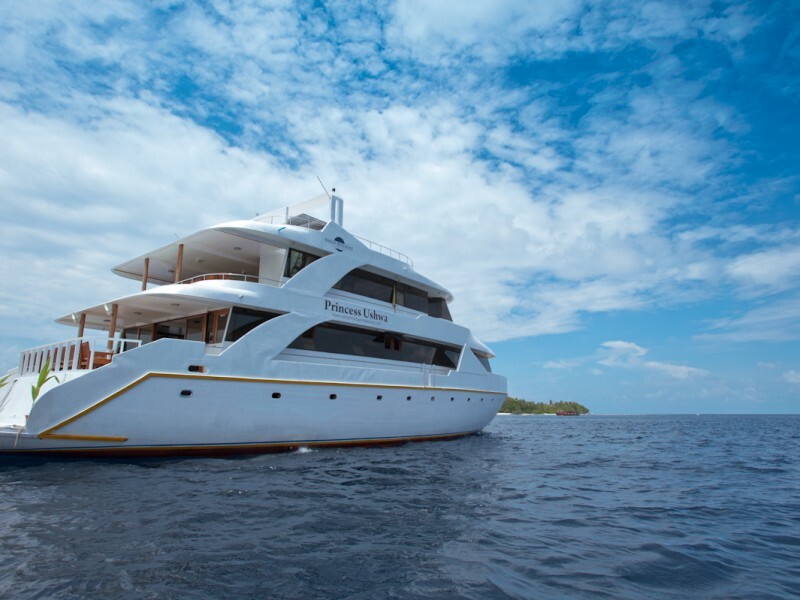 The Sea Spirit is managed by two highly professional Cruise Directors who are fully qualified Dive Instructors and have many years of liveaboard experience behind them. 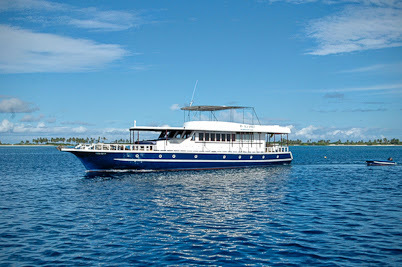 They guide and coordinate the dive planning and ensure that the standards of your holiday are maintained in every way. 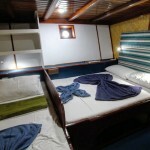 A good crew and experienced dive team are essential for the successful operation of a liveaboard. 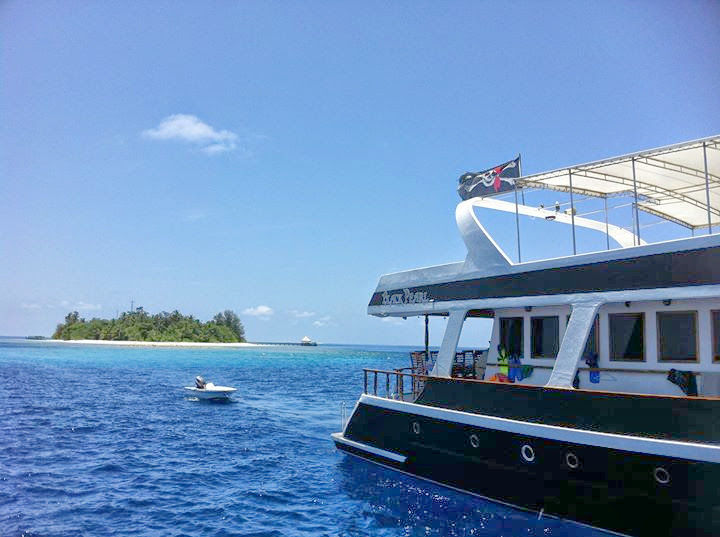 With many years experience in the Maldives, the Sea Spirit’s team is able to consistently deliver a high standard of service safety and care. 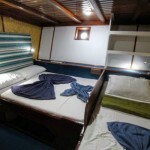 This is a roomy cabin with a full size double bed. 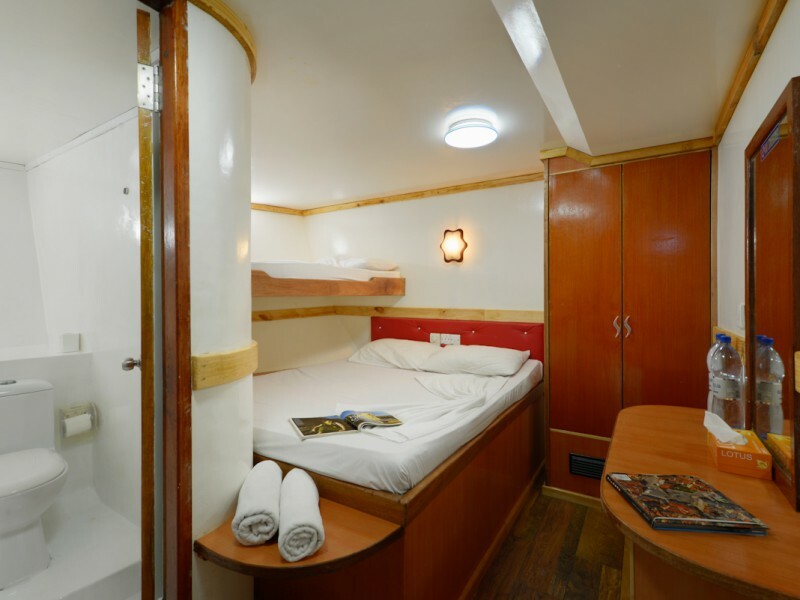 The cabin has individually controlled air-conditioning, a large wall-mounted fan, port hole, a reading light at the head of each bed and a hanging wardrobe. 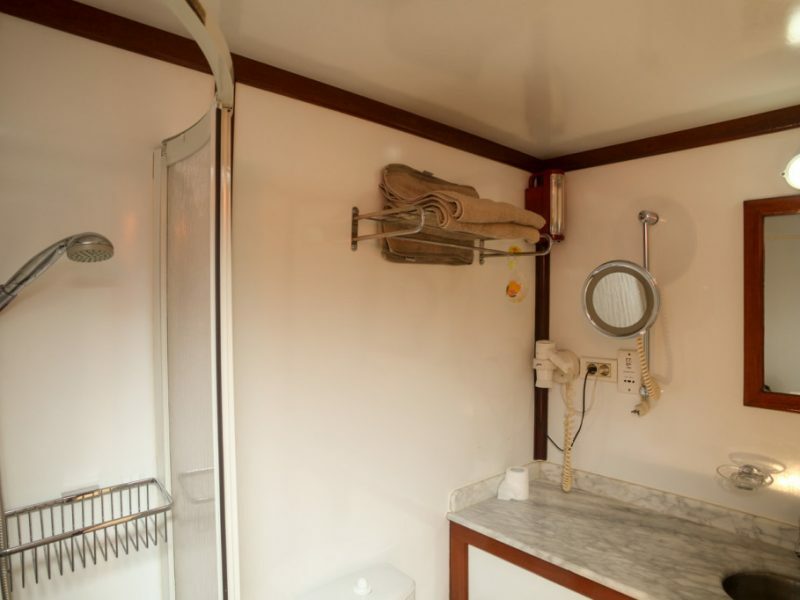 Bathrooms are en-suite with hot water shower, domestic WC and wash hand basin. 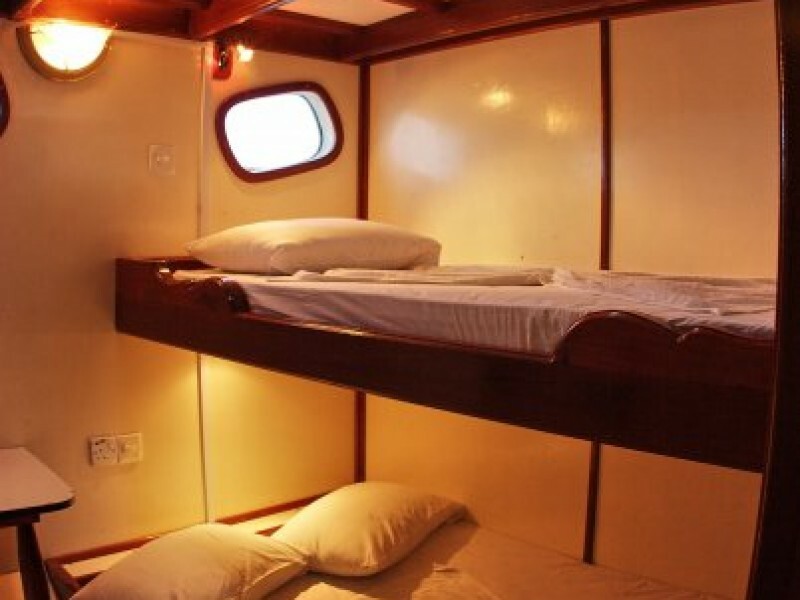 This is a roomy cabin with a full size double bed and full size single bed all on one level. 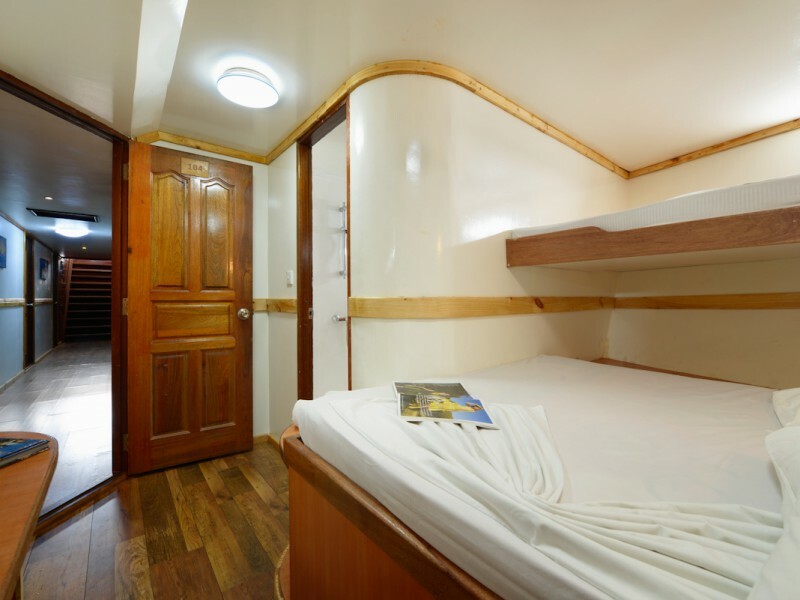 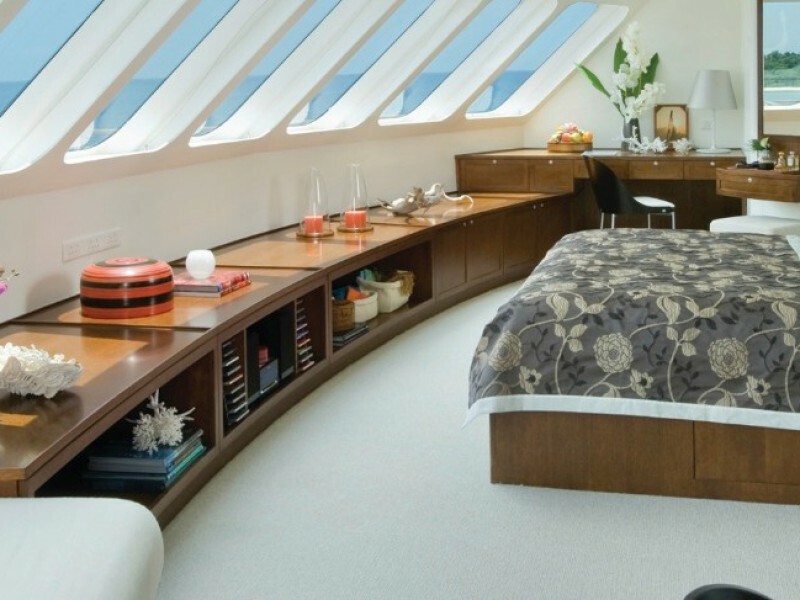 The cabin has individually controlled air-conditioning, a large wall-mounted fan, port hole, a reading light at the head of each bed, a hanging wardrobe and under-bed storage. 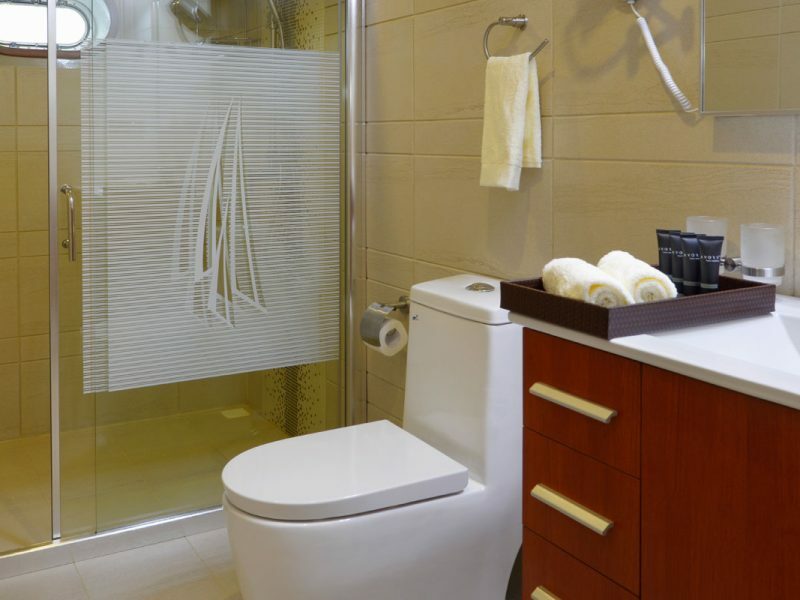 Bathrooms are en-suite with hot water shower, domestic WC and wash hand basin. 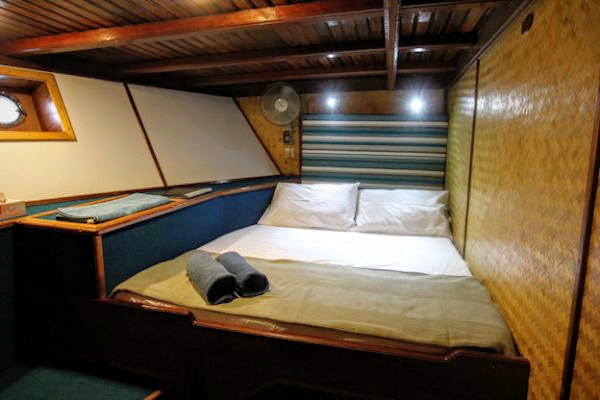 This is a roomy cabin with a full size double bed and full size single bed all on one level. 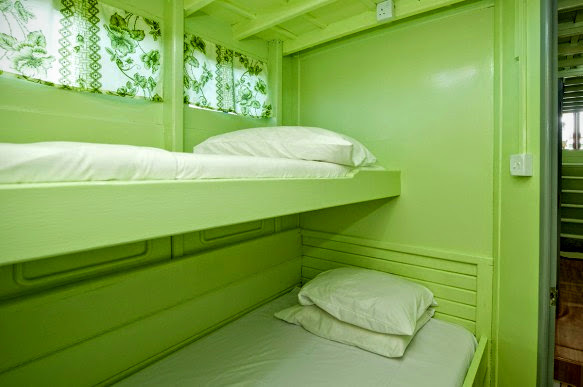 The cabin has individually controlled air-conditioning, a large wall-mounted fan, port hole, a reading light at the head of each bed, a hanging wardrobe and underbed storage. 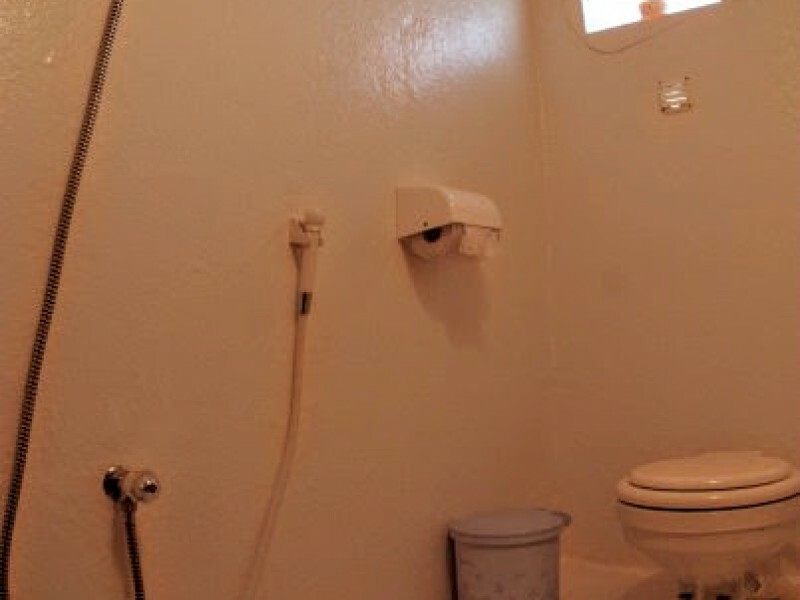 Bathrooms are en-suite with hot water shower, domestic WC and wash hand basin. 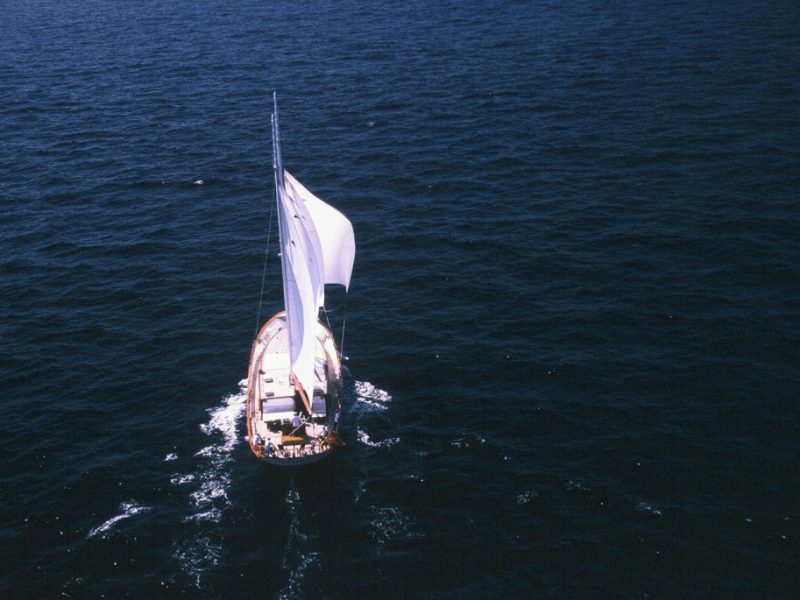 Posted on March 9, 2016 at 7:44 am. 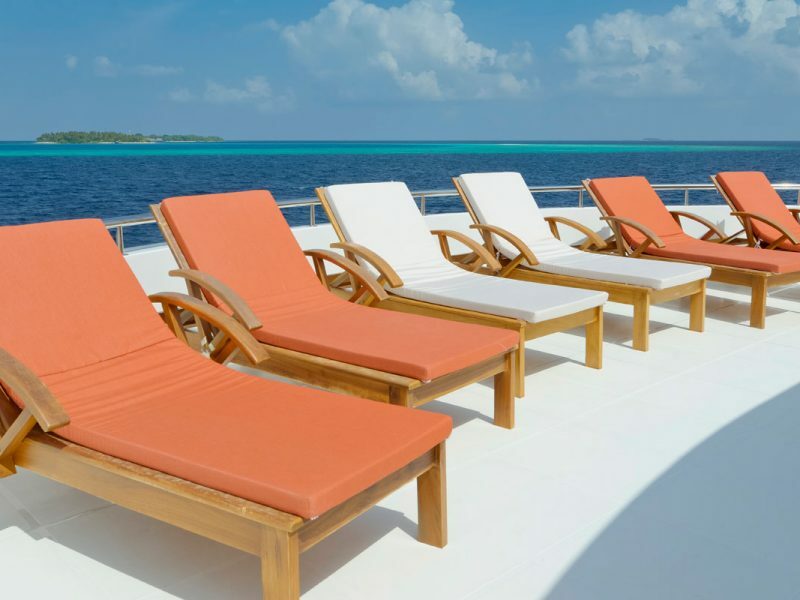 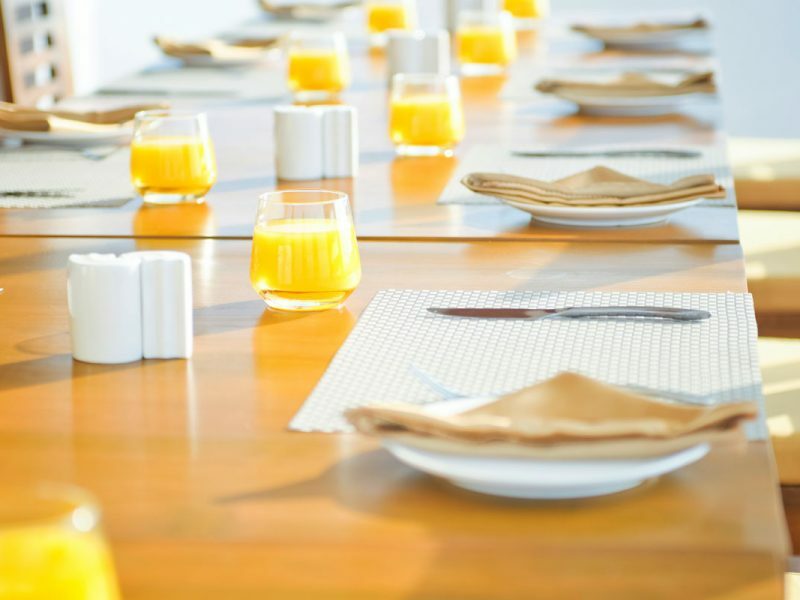 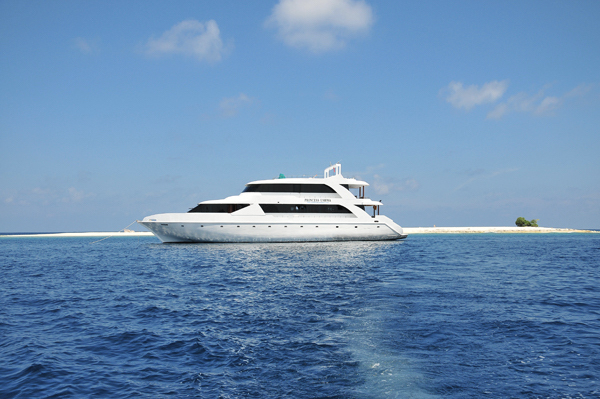 Gahaa is designed to suit for larger groups who wish for a short getaway. 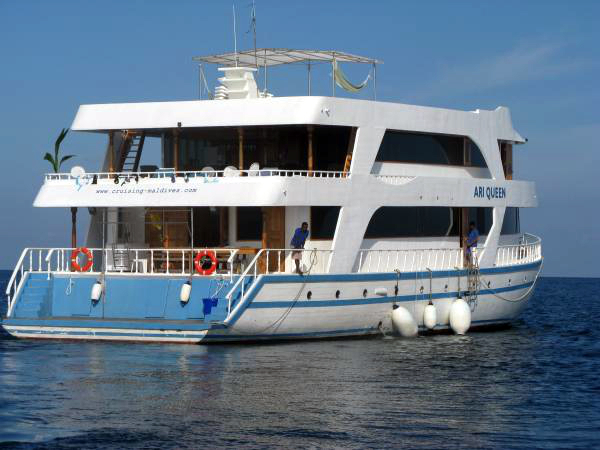 Families and large group of friends who have come aboard Gahaa are among our repeat clients who have become accustomed to Gahaa’s services. 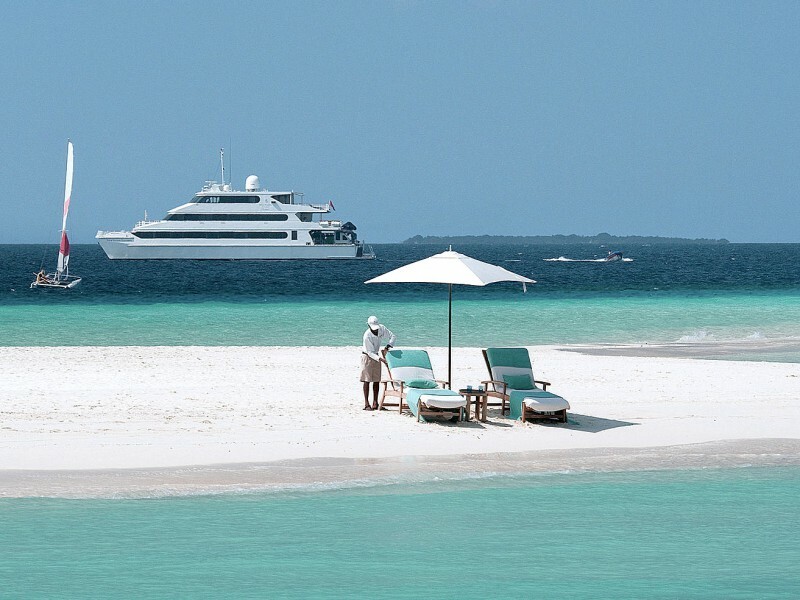 Find yourself unwinding with a stroll on countless sands and endless green or visit an island to experience the unique lifestyle of the Maldivians. 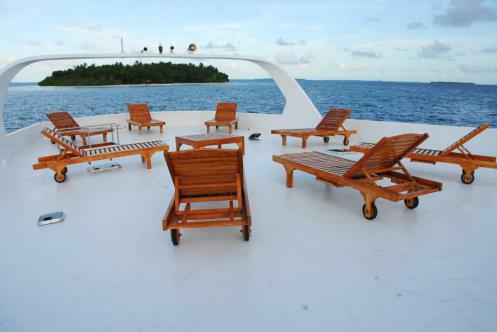 At night, revel to the beat of Boduberu and experience Maldivian culture in style. 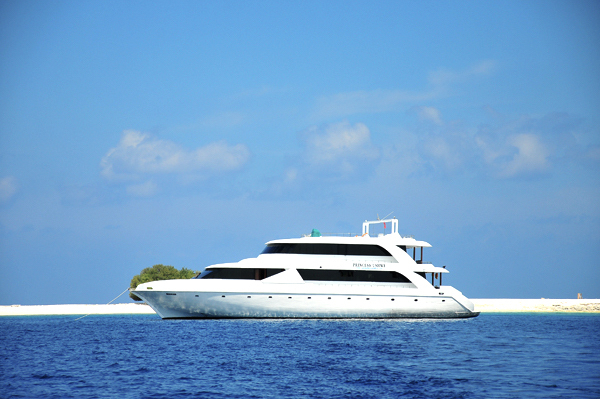 Gahaa promises to take you to such extents to make sure that its the perfect way to make the infinite ocean your home for a few days. Posted on January 13, 2016 at 6:01 am. 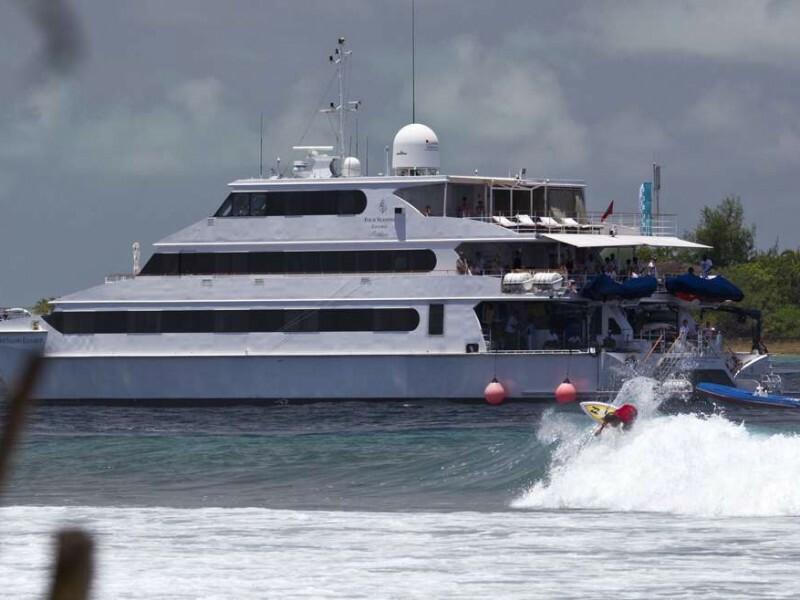 Surfatoll is a Maldives surf trip specialist operating in the Maldives islands. 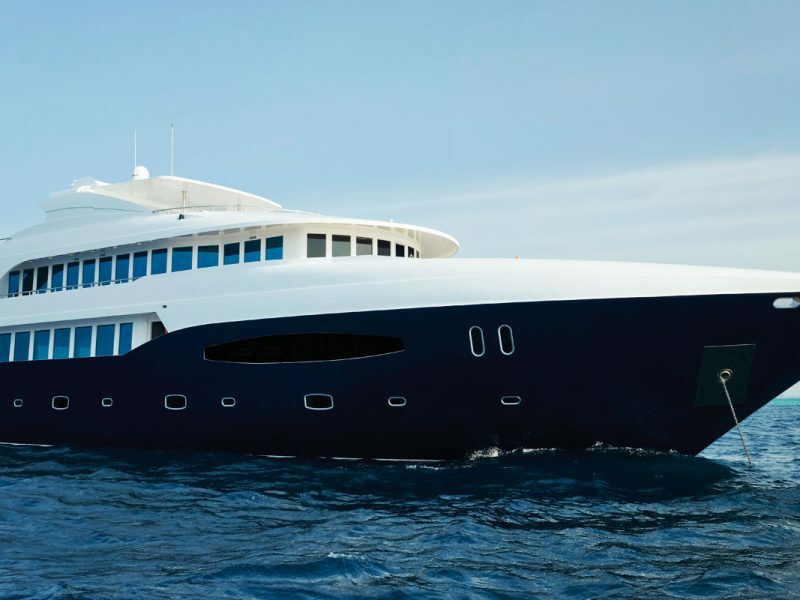 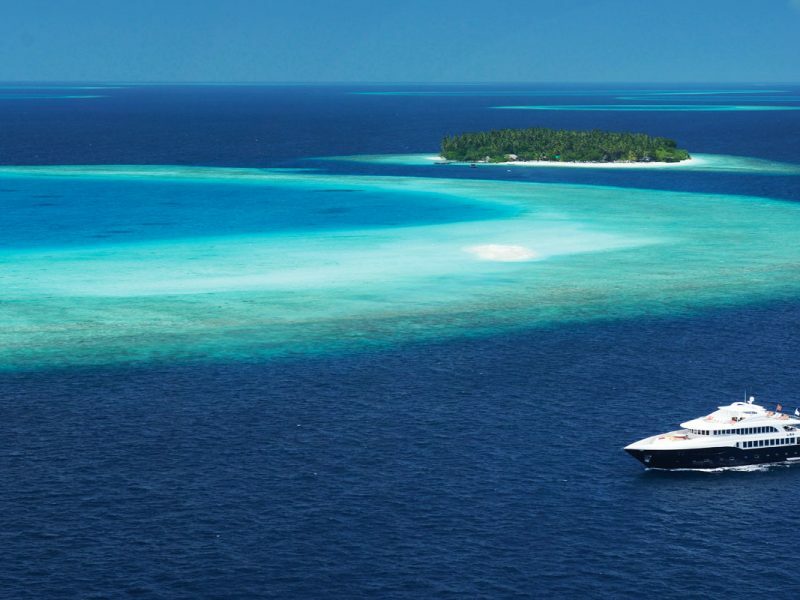 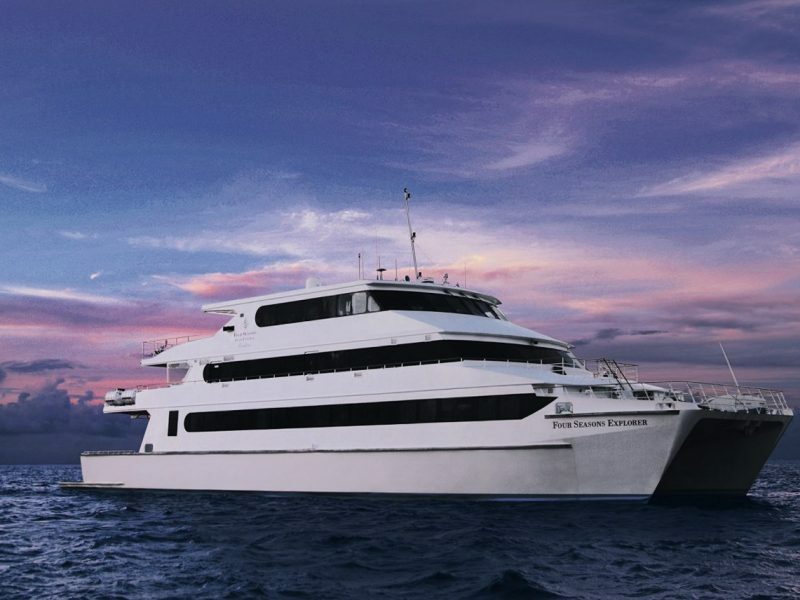 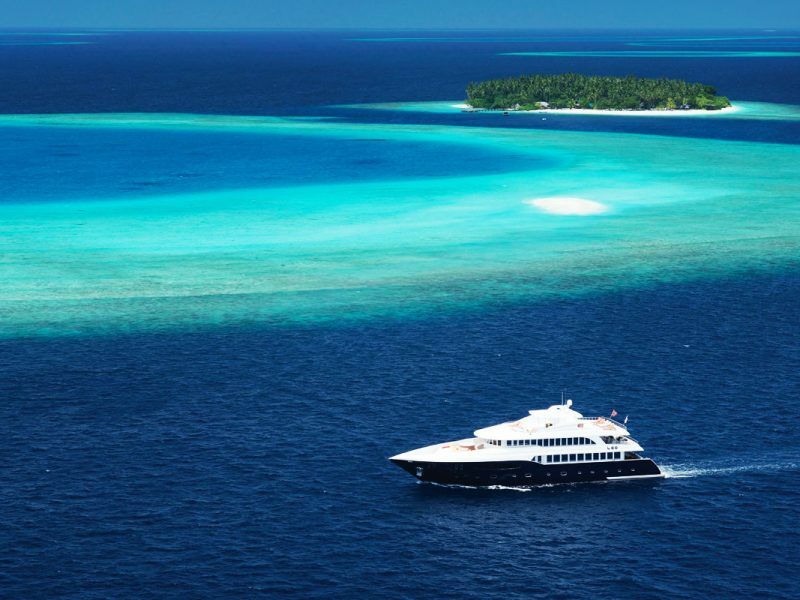 Their fleet will allow you to discover this tropical jewel located in the middle of the Indian Ocean. 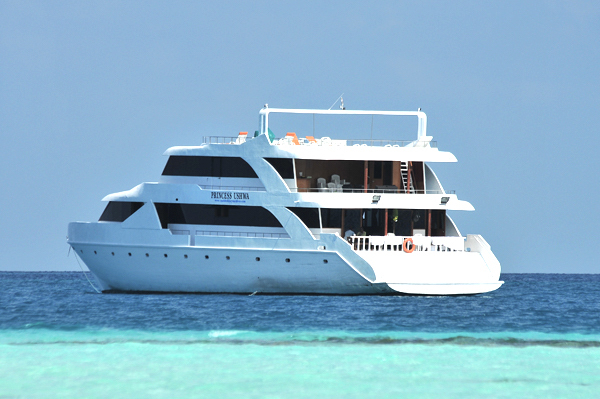 A Maldives surf trip on a boat is the ideal way to find the best waves. 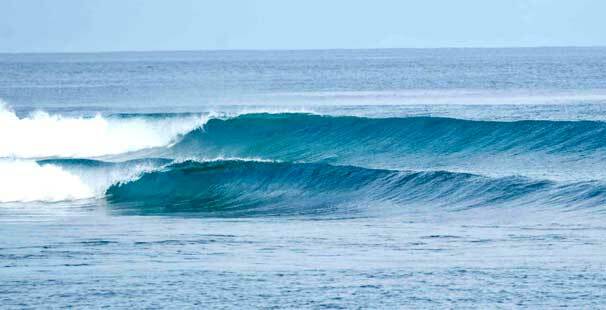 Surfing perfect waves in the Maldives’ turquoise waters is an experience you will never forget. 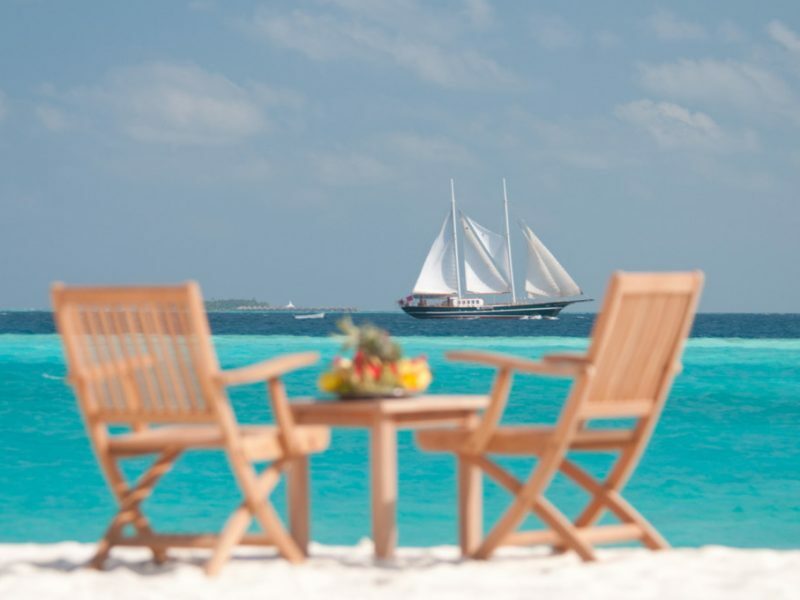 Posted on November 2, 2015 at 12:39 pm. 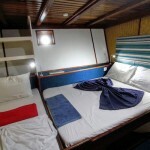 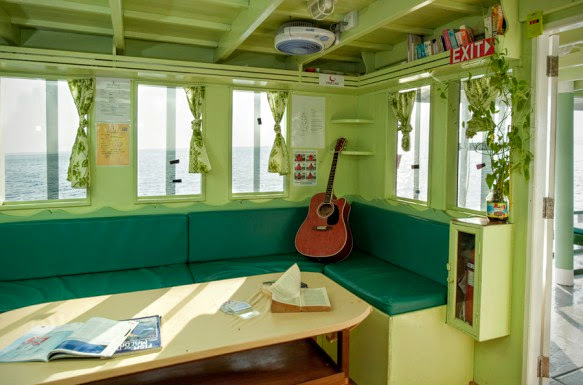 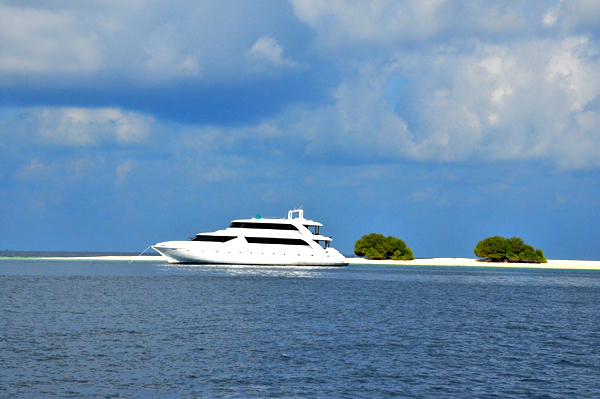 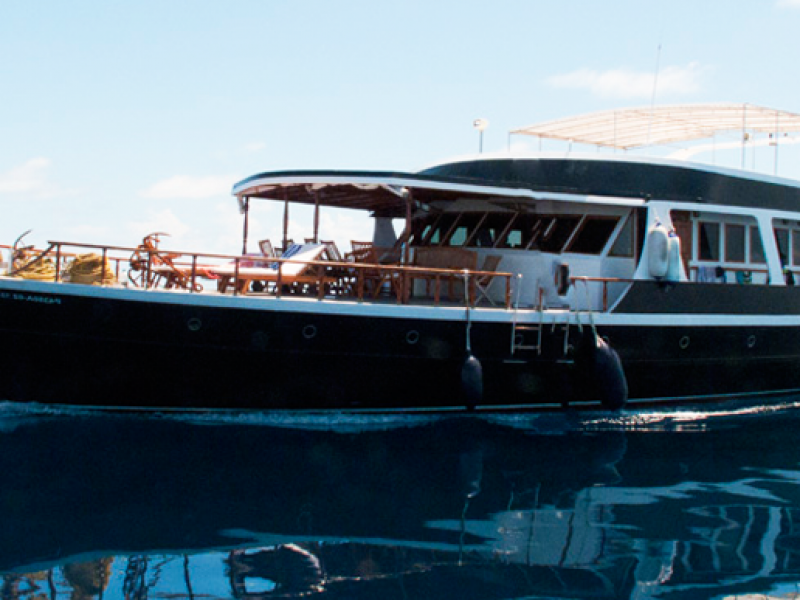 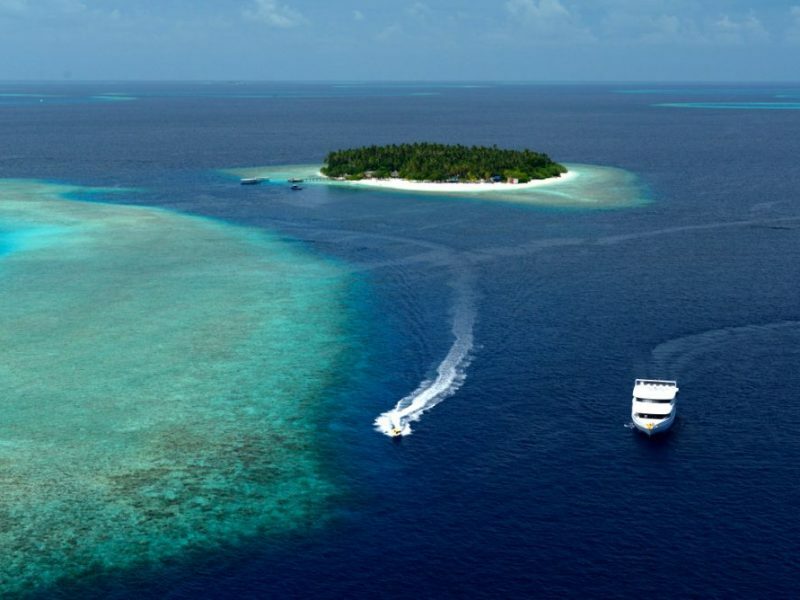 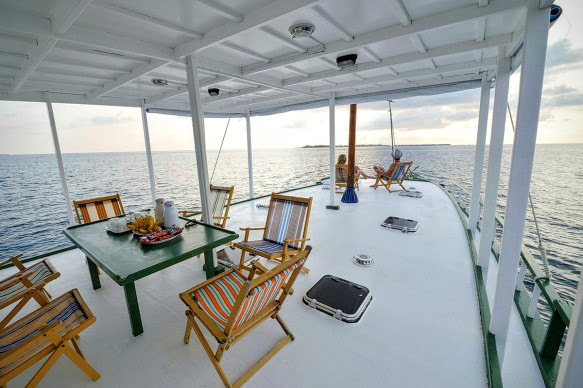 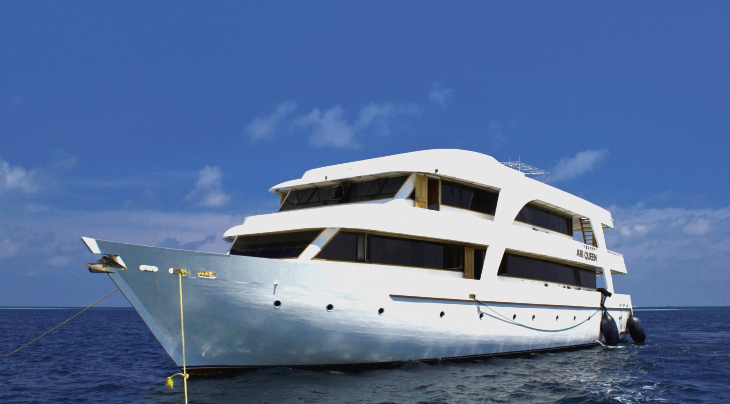 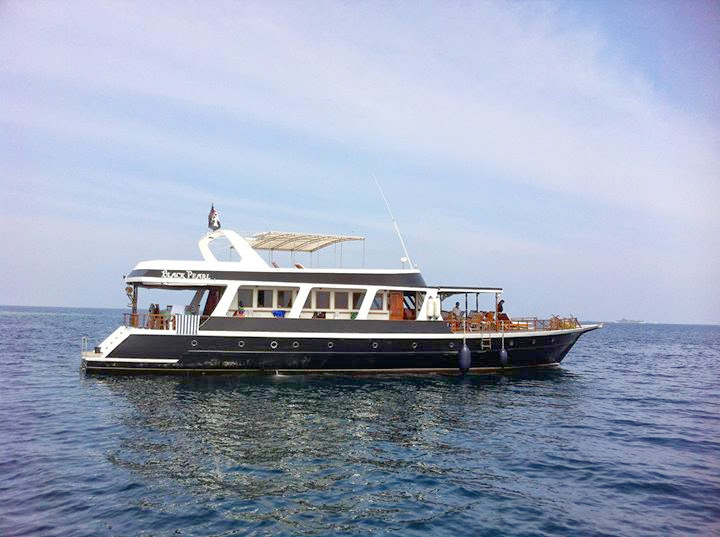 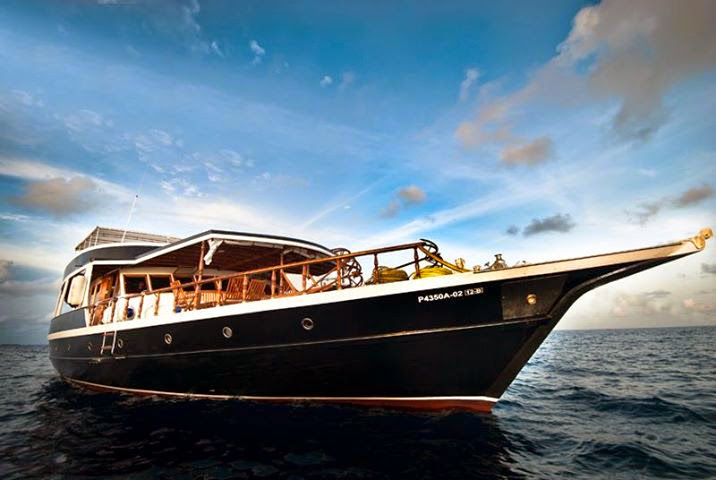 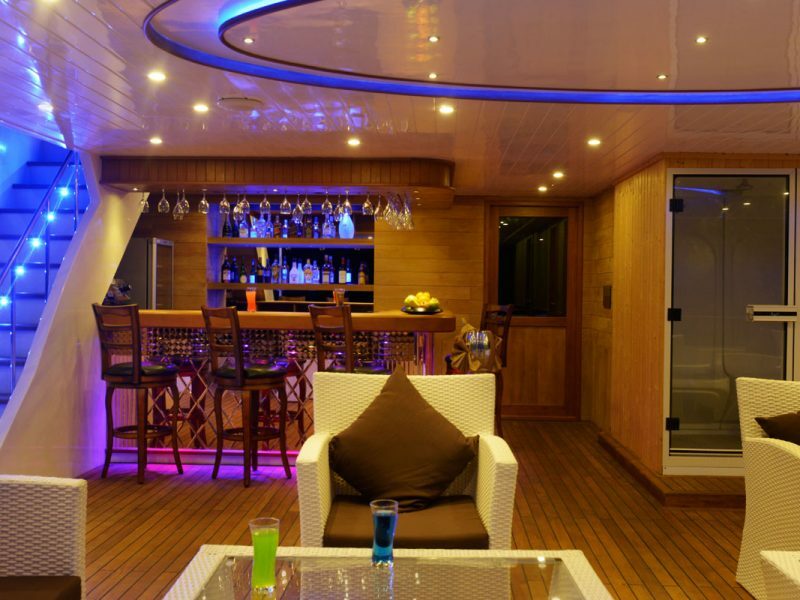 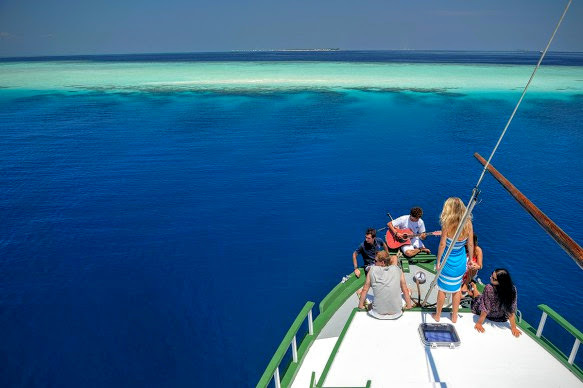 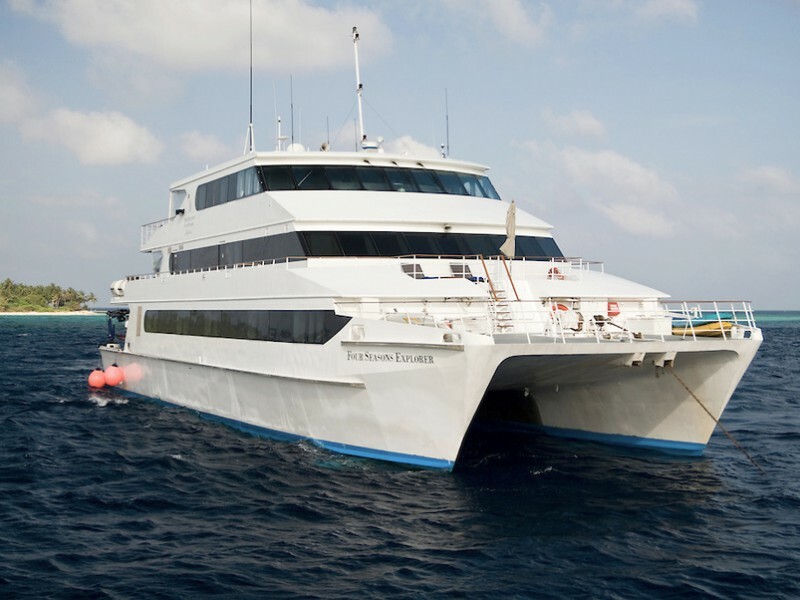 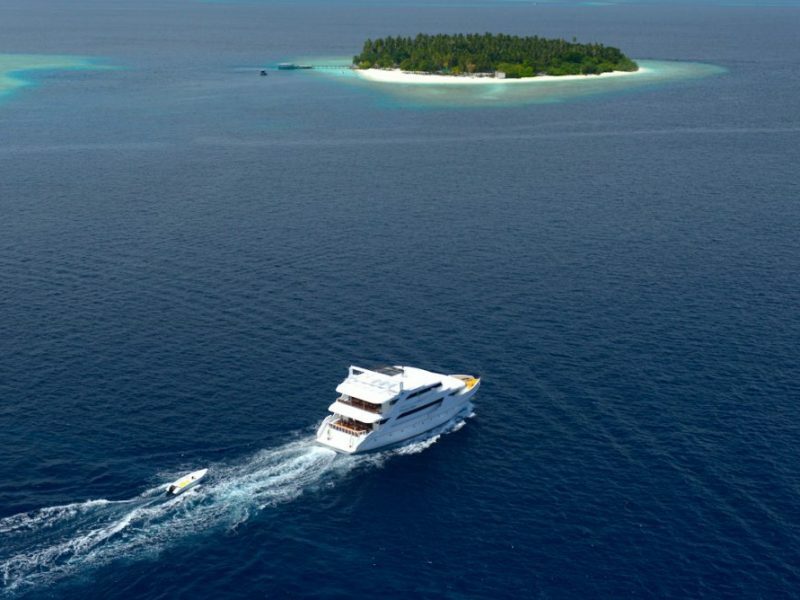 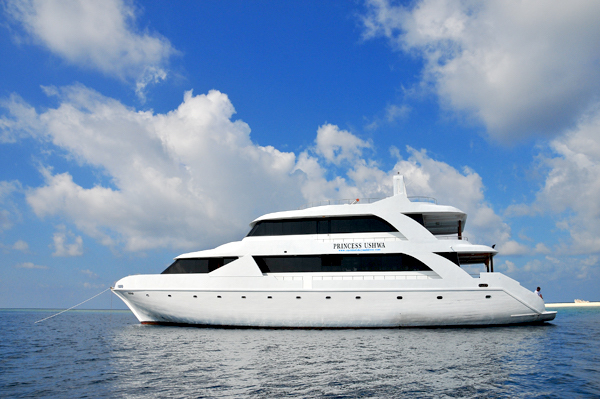 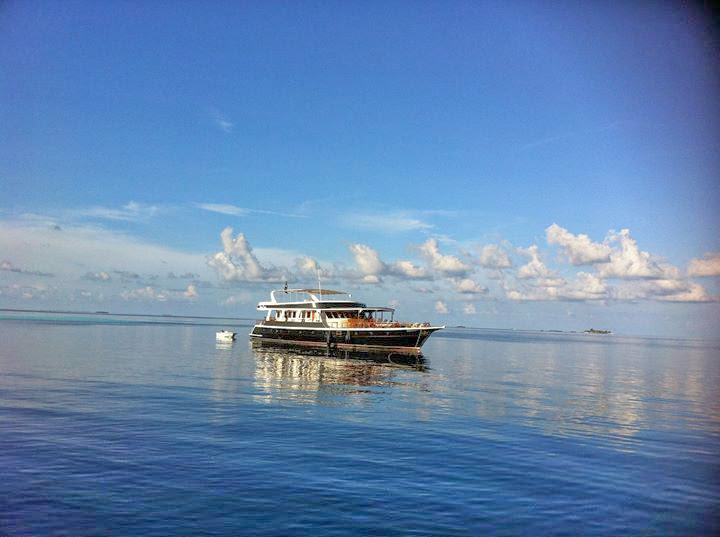 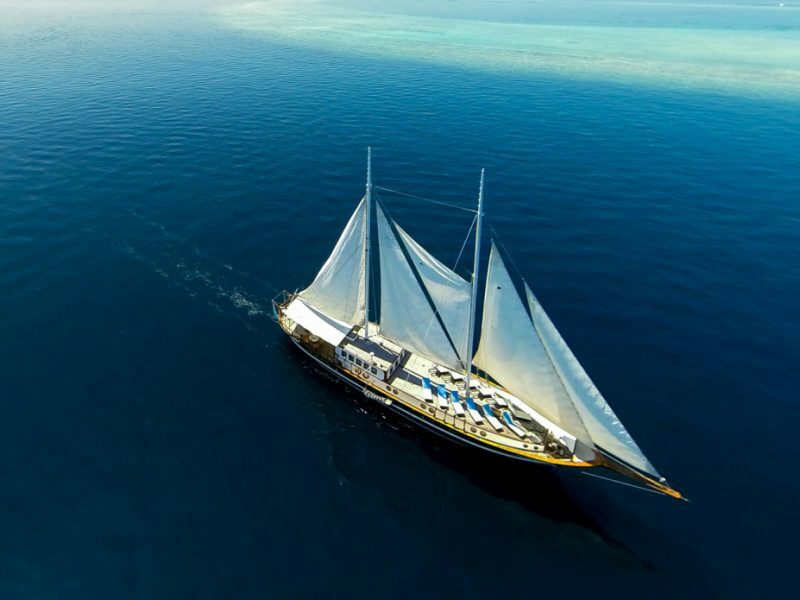 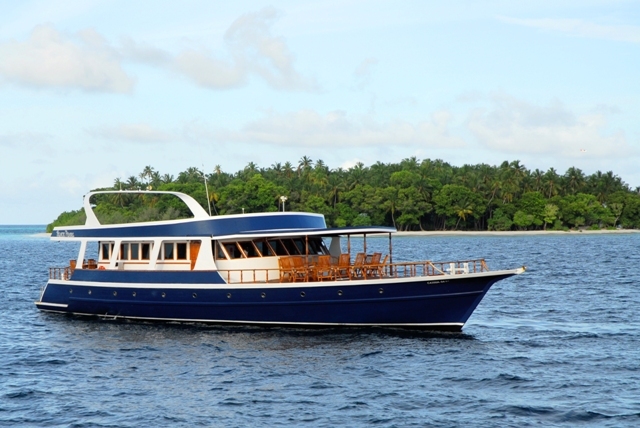 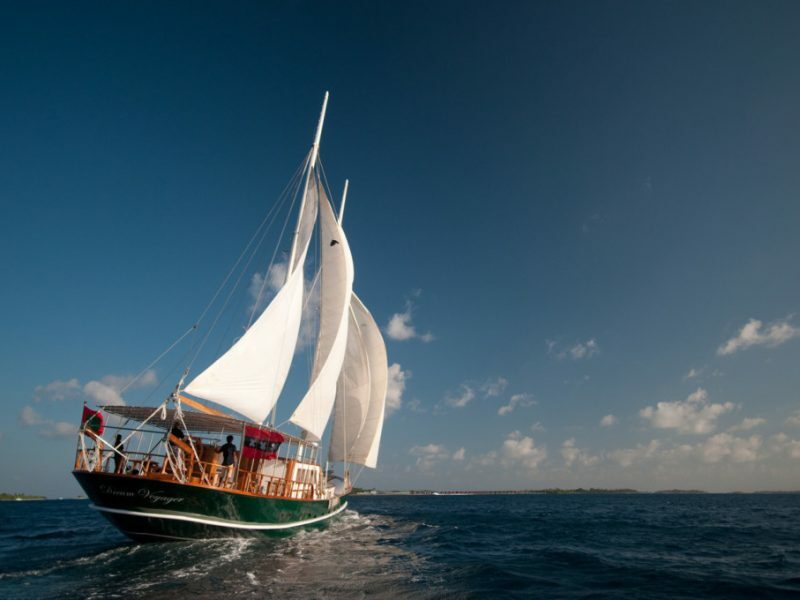 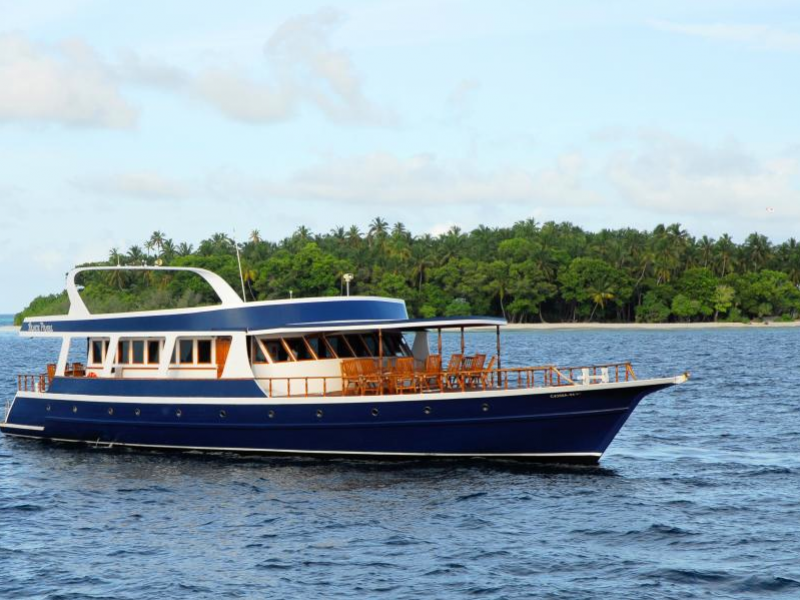 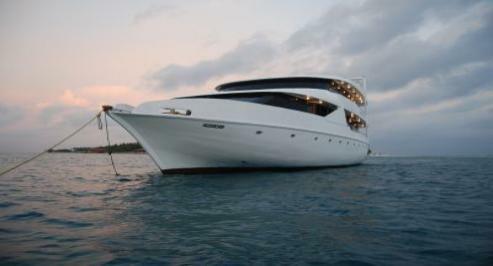 Nooraanee 2 is a multi-purpose liveaboard vessel in Maldives. 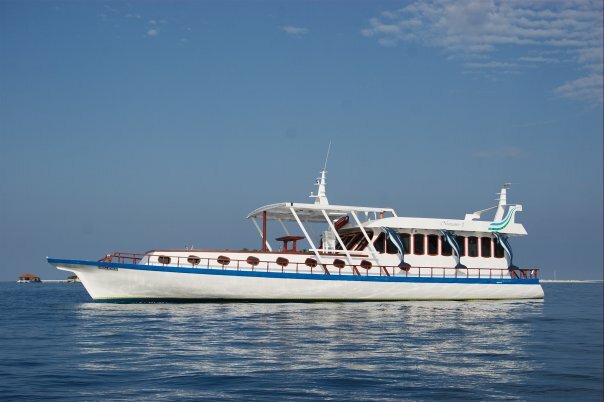 It is specialised for big game fishing and cruising as well as surfing trips. 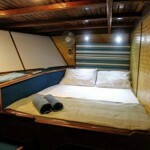 Nooraanee 2 caters well to fishing safaris, with a low stern and 6 rod holders installed. 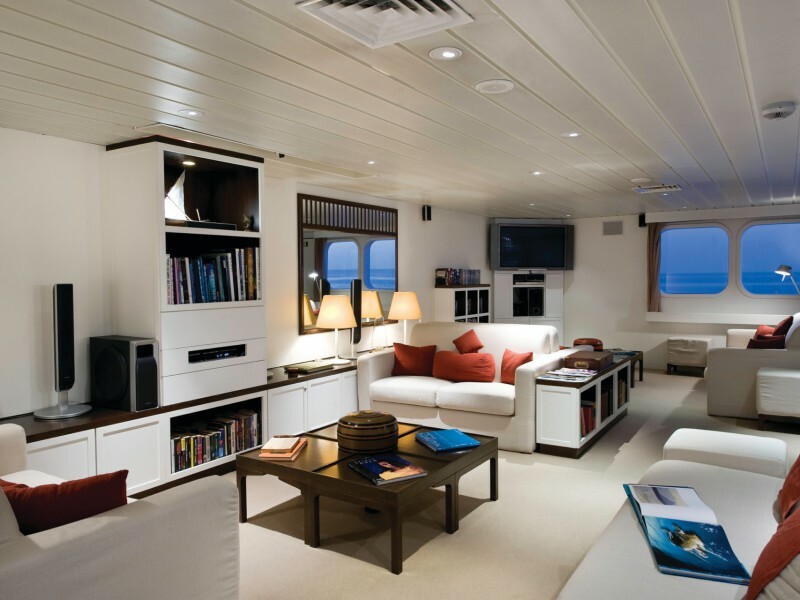 The crew has excellent knowledge of the local fishing grounds, and a fish finder is installed. 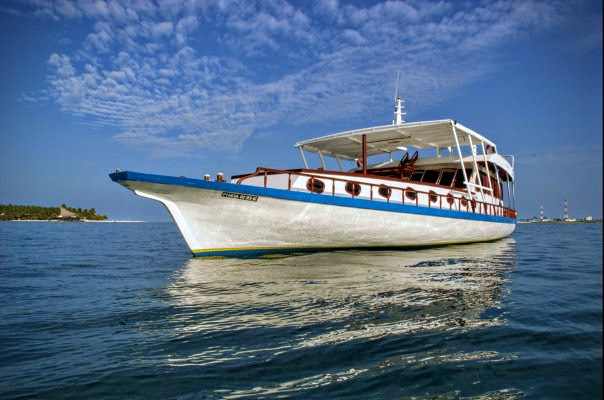 Surfing and Cruising safaris are offered as a norm, and Diving is arranged on request. 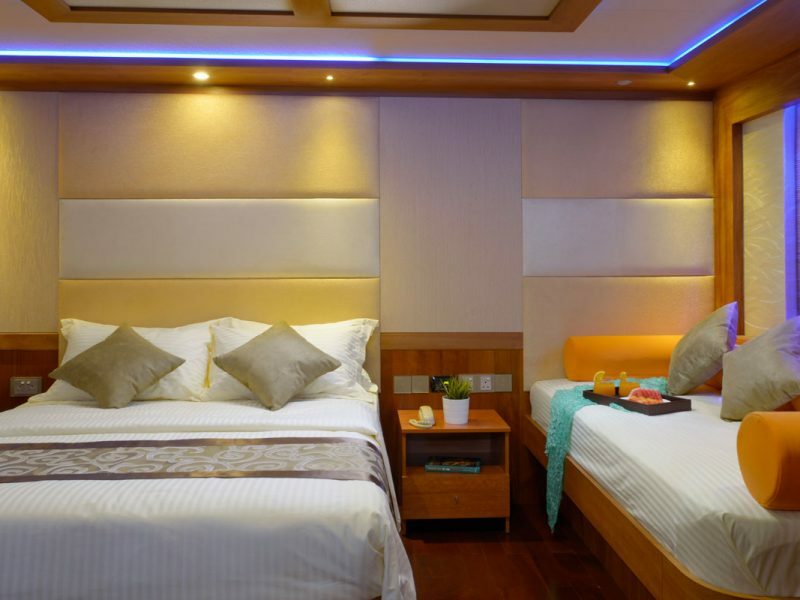 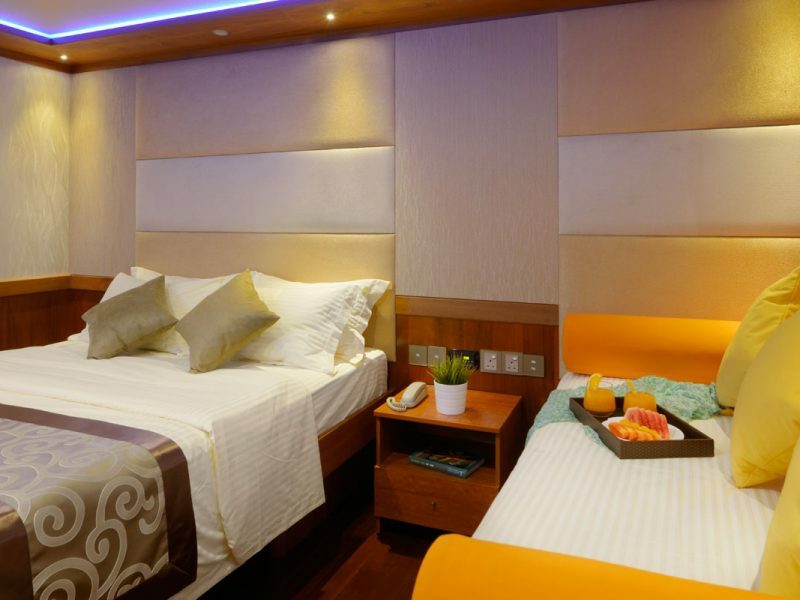 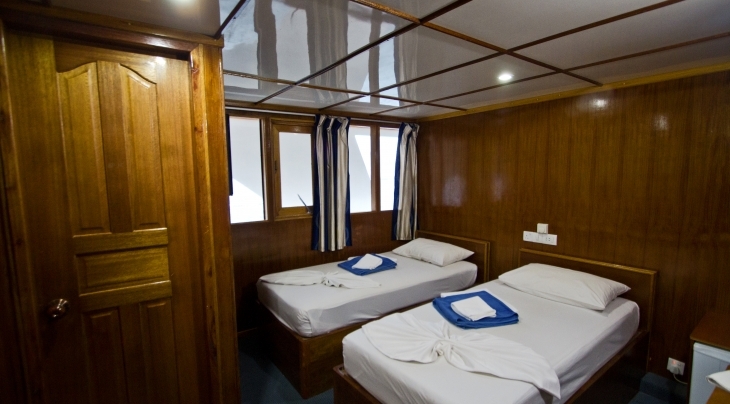 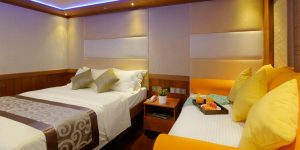 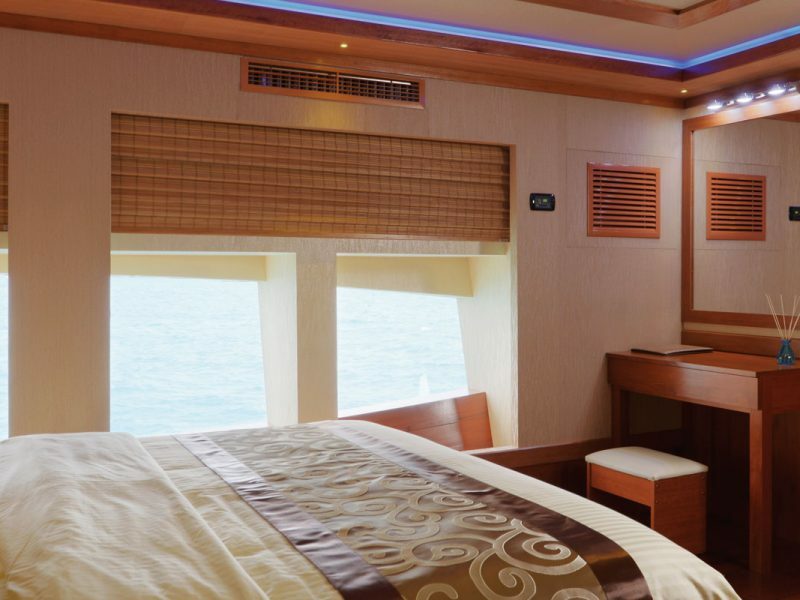 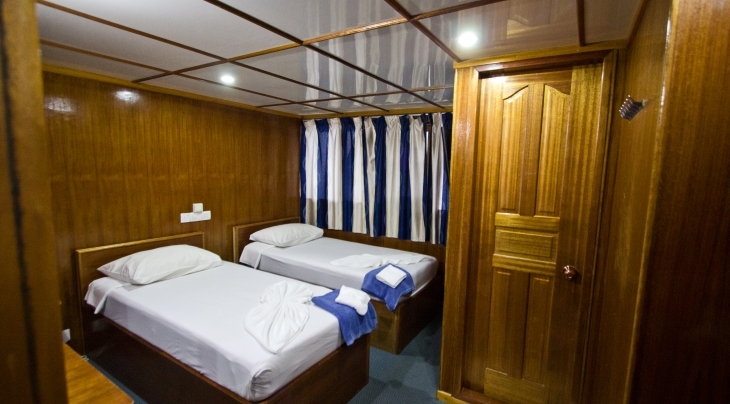 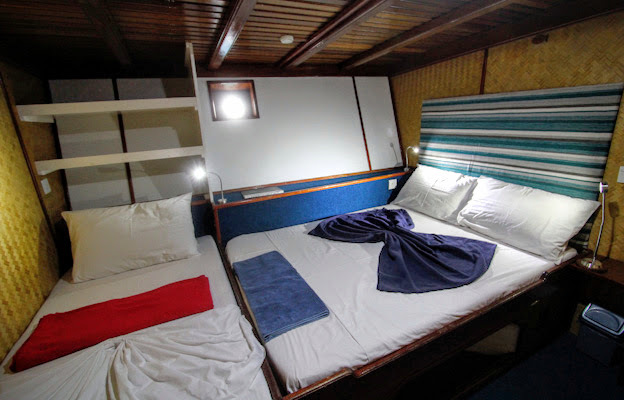 All rooms onboard are air-conditioned and furnished with two bunk beds (one single & one double) and have attached toilets. 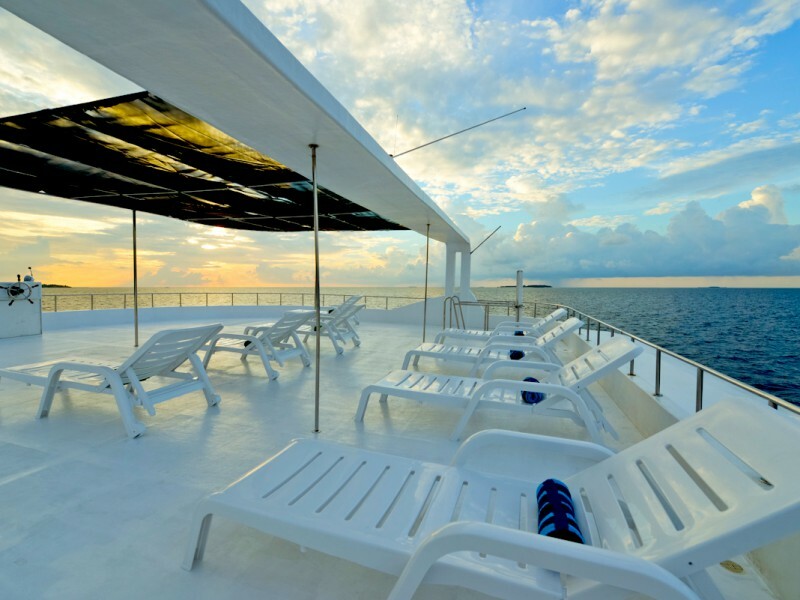 Posted on May 28, 2015 at 12:21 pm. 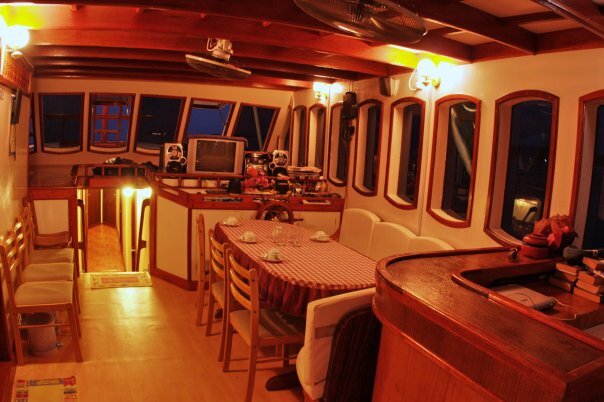 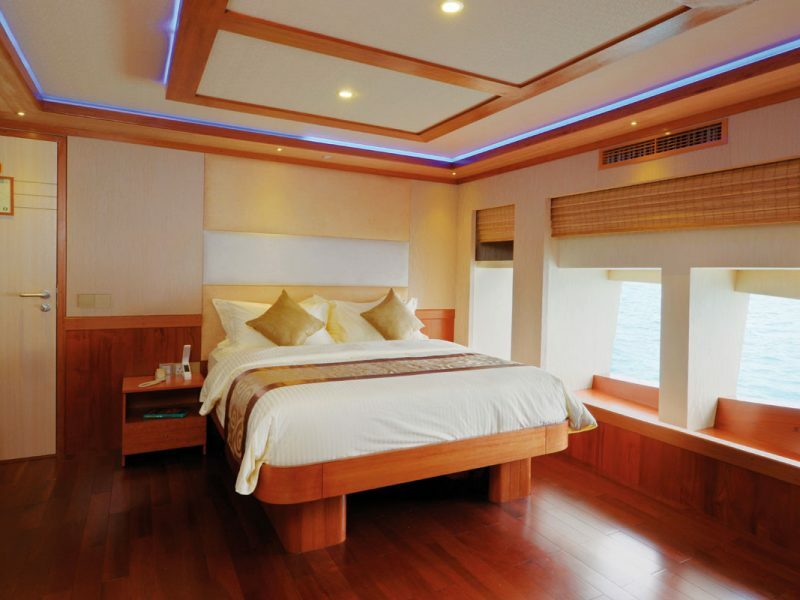 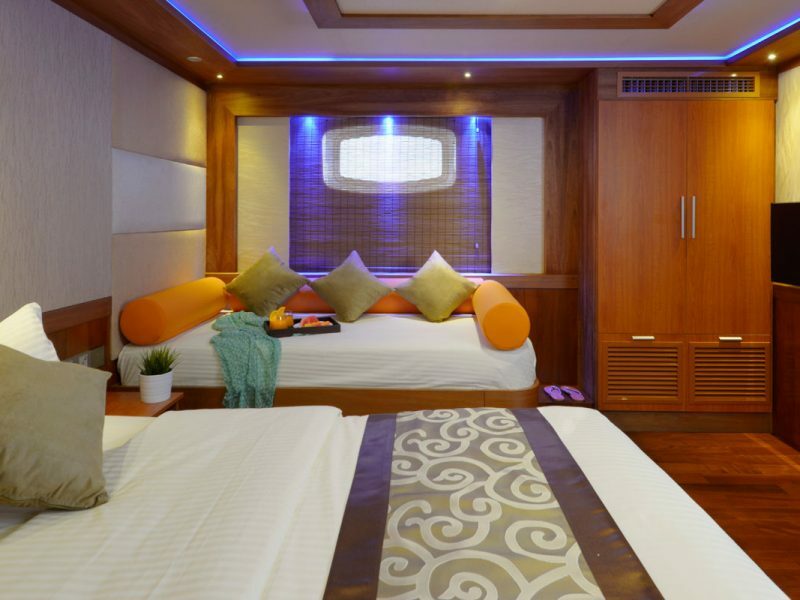 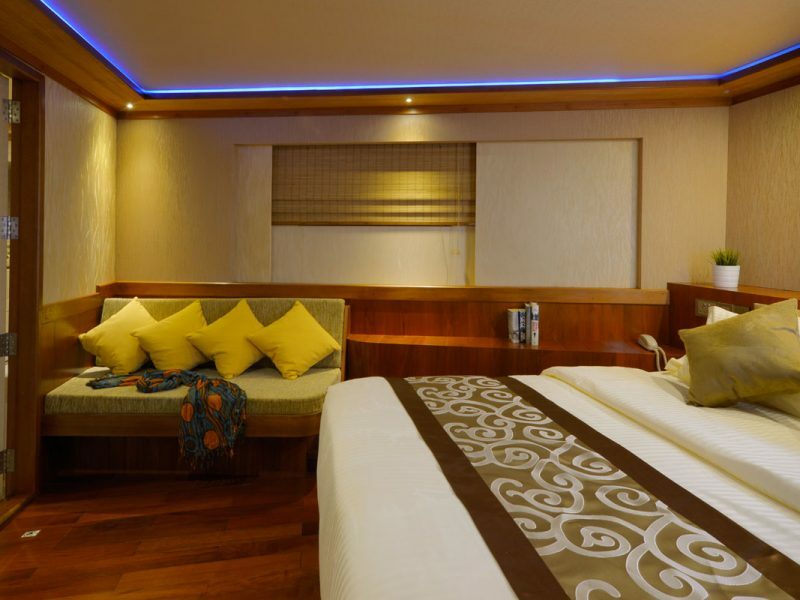 Princess Ushwa Safari Boat offers a unique hospitality with its beautifully designed and exotic environment. 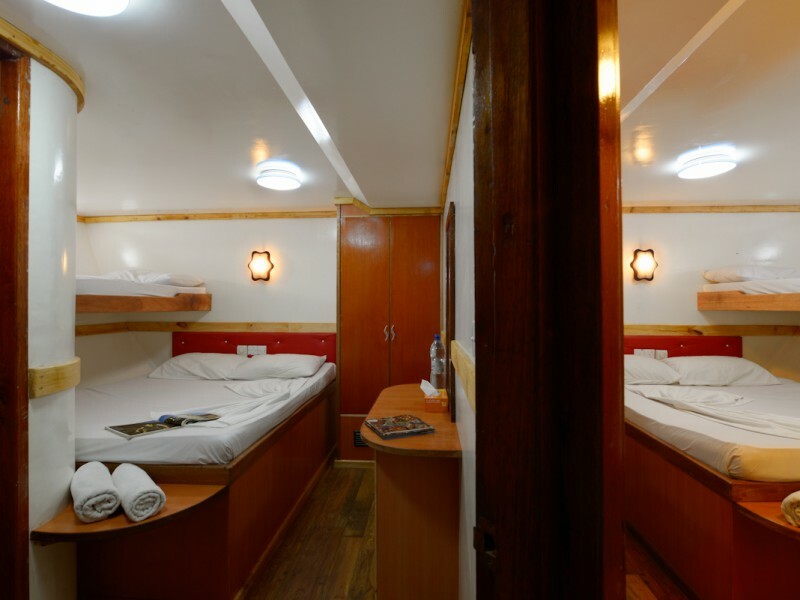 All the cabins are designed for comfort. 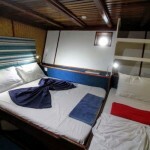 The rooms are fully air-airconditioned , with hot and cold shower. 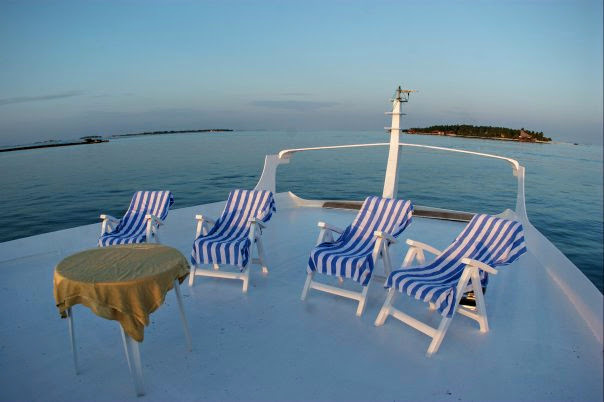 The crew are always available to provide contented services to make the holidays aboard a memorable one. 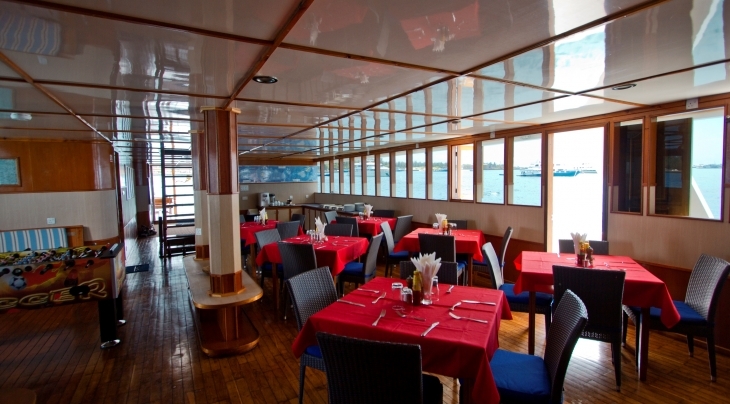 All the meals are served in the main Saloon “Princess Ushwa restaurant”. 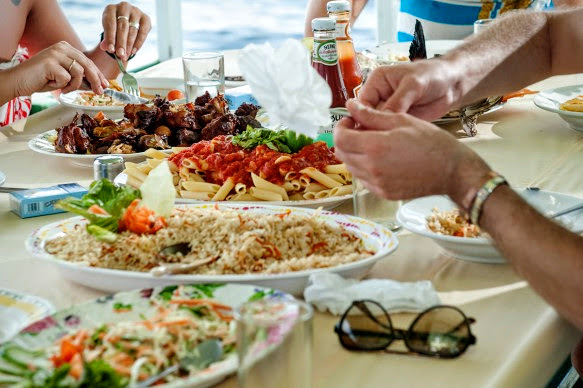 Rich Buffet and various western and Oriental dishes are on the menu. 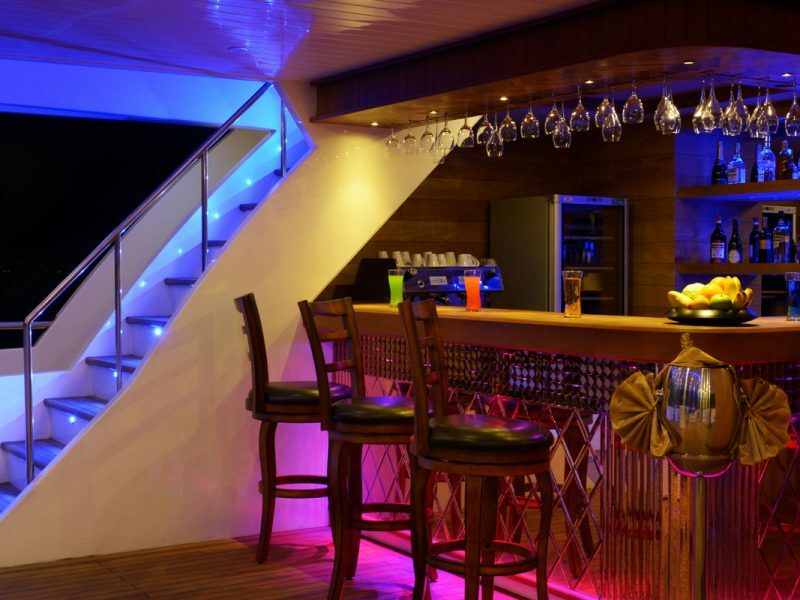 Princess Ushwa Bar “Main Bar” is located on the main entrance and is well stocked with Wines, Alcoholic and non Alcoholic beverages, local/International Cocktails are offered too. 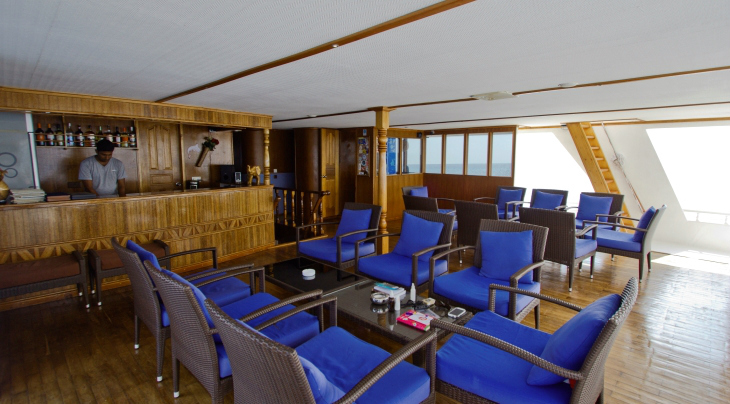 Bar Opens from 0700 Hrs in the morning till midnight or when the last guest leaves bar. 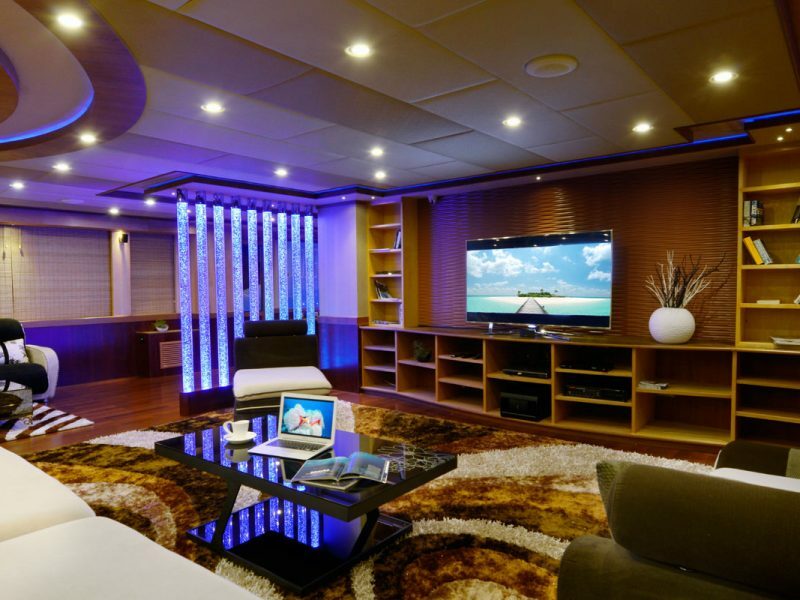 Games and light entertainment is offered. 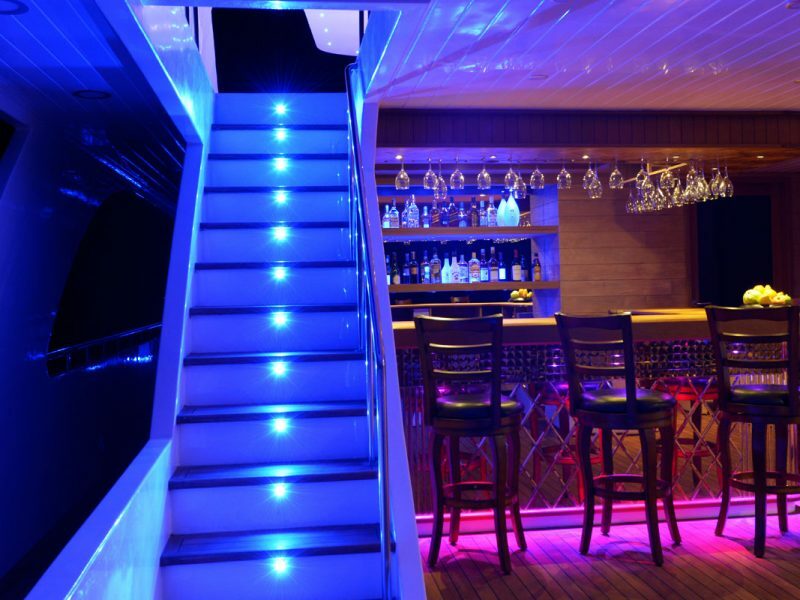 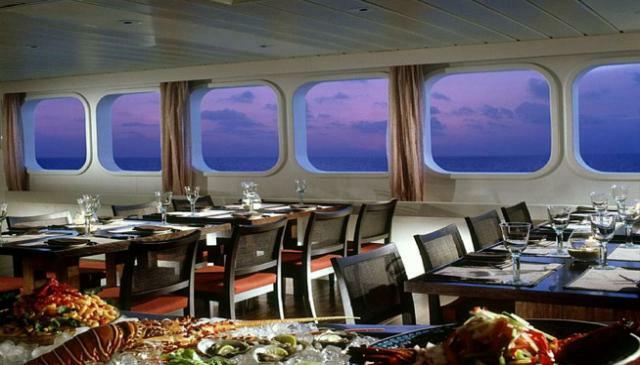 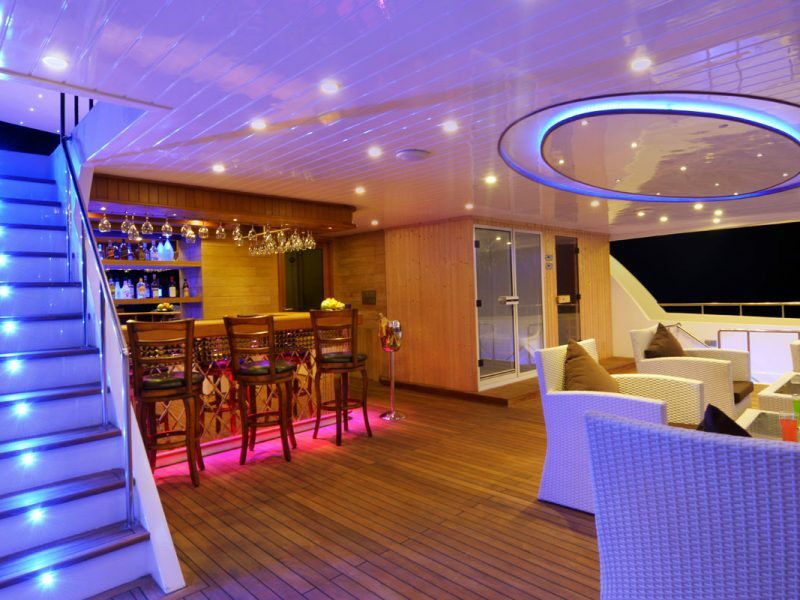 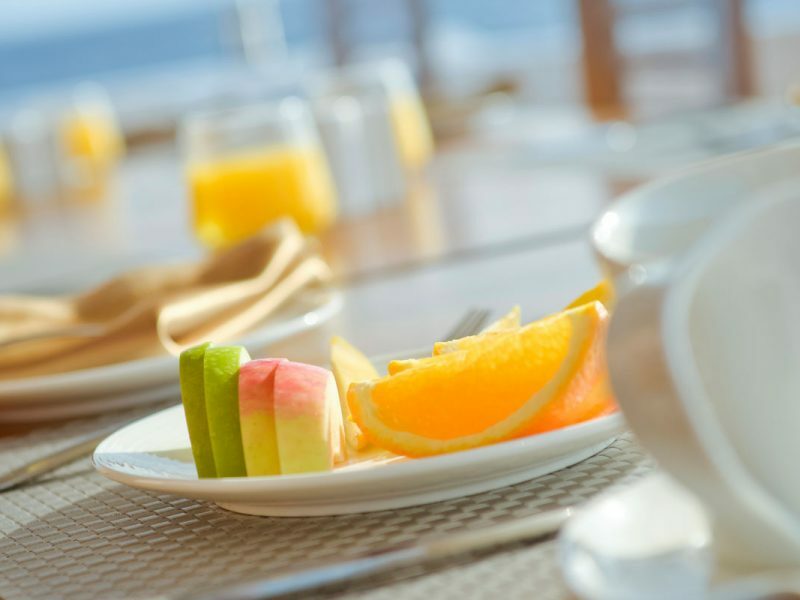 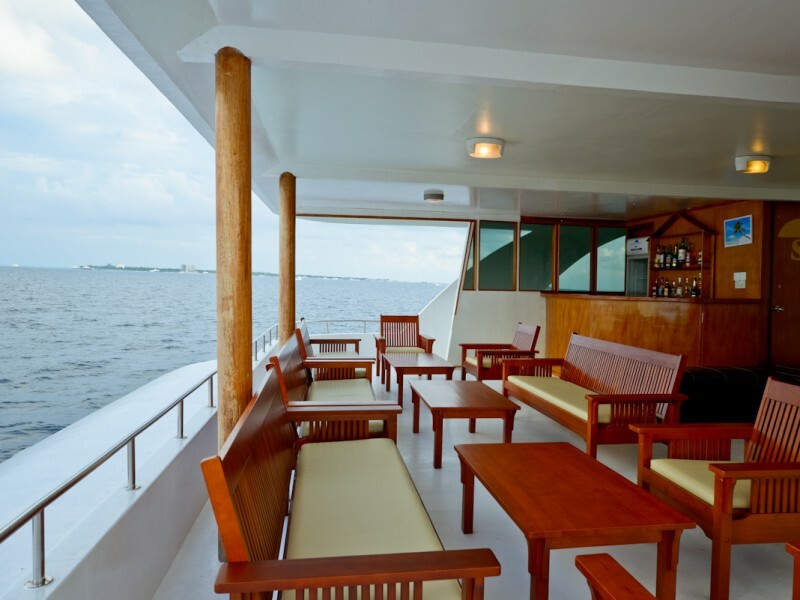 Bar services are available on the upper deck with sea view and the marine life. 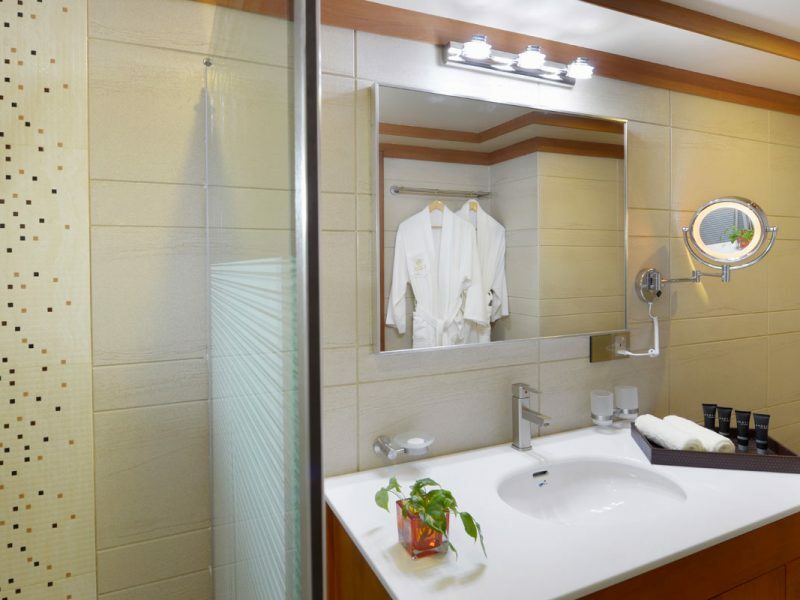 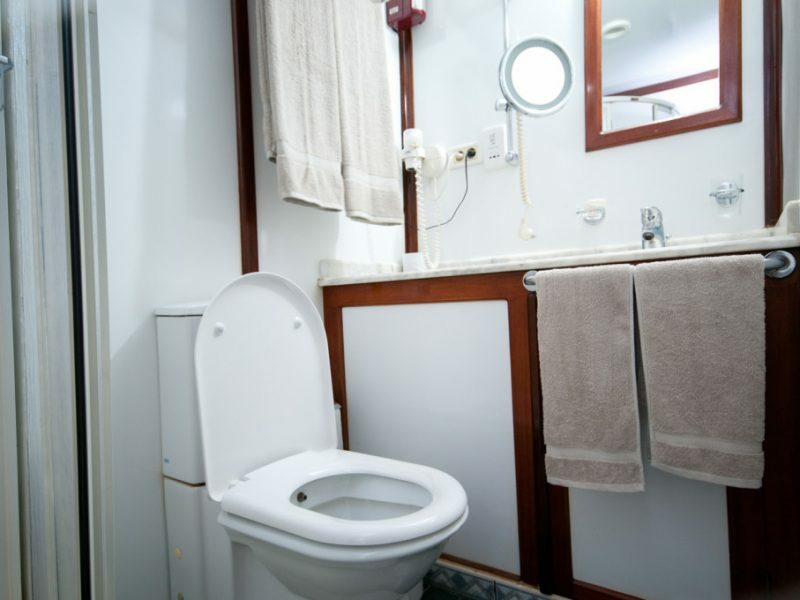 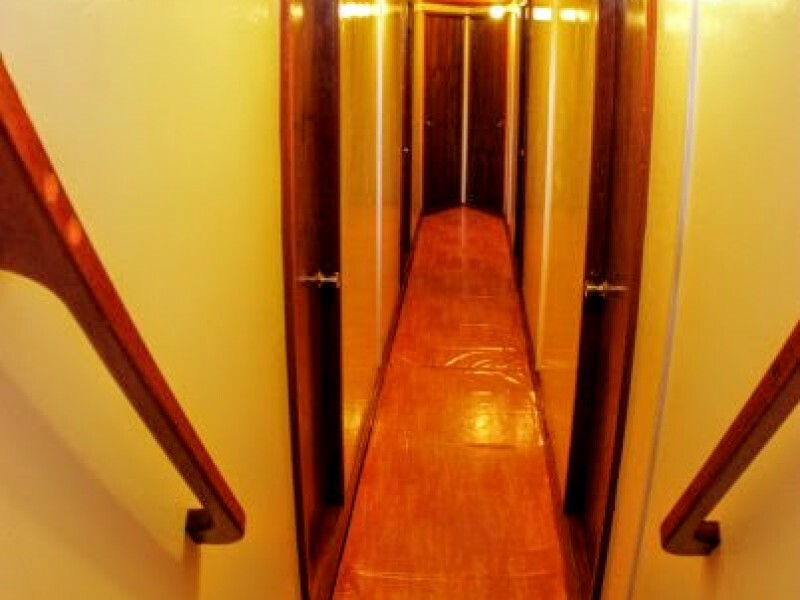 All cabins have attached bathrooms with hot & cold water. 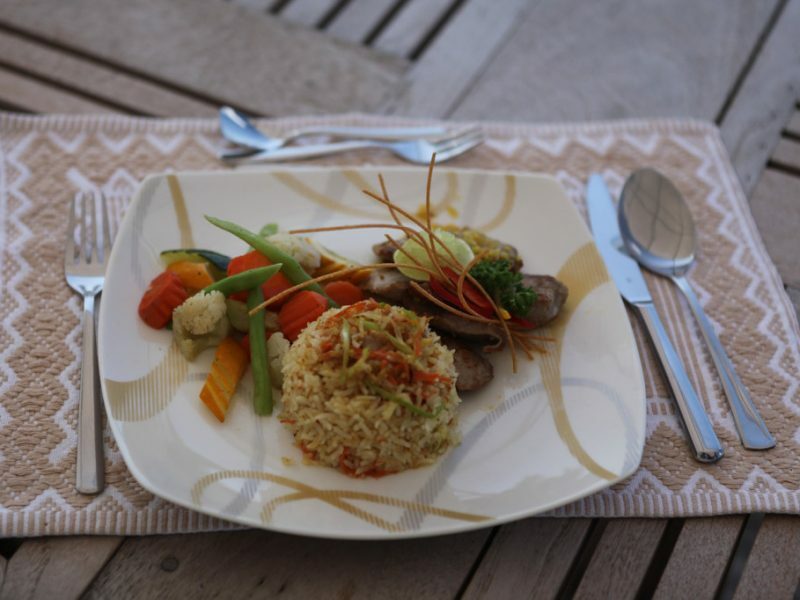 Kitchen: Full board 3 meals, a balanced mixture of local and European cuisine. 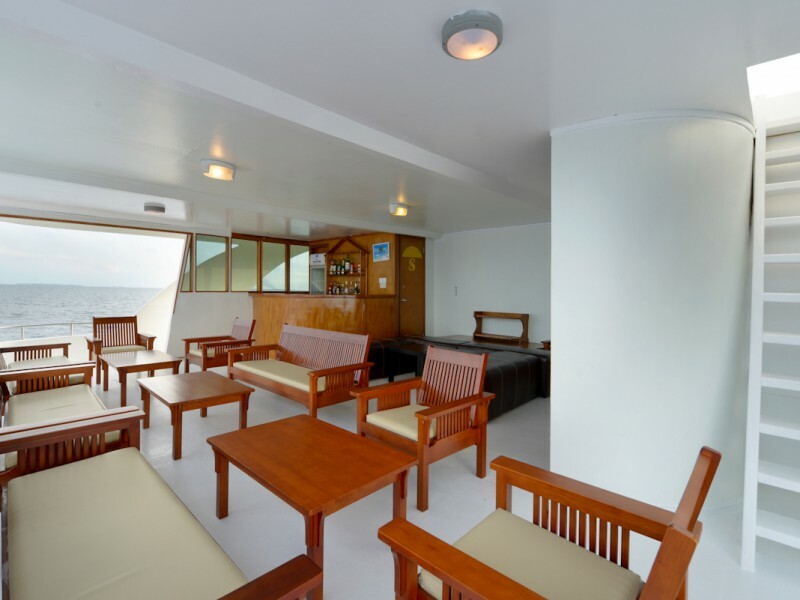 Safety Equipment: Fire extinguishers, Life Jackets. 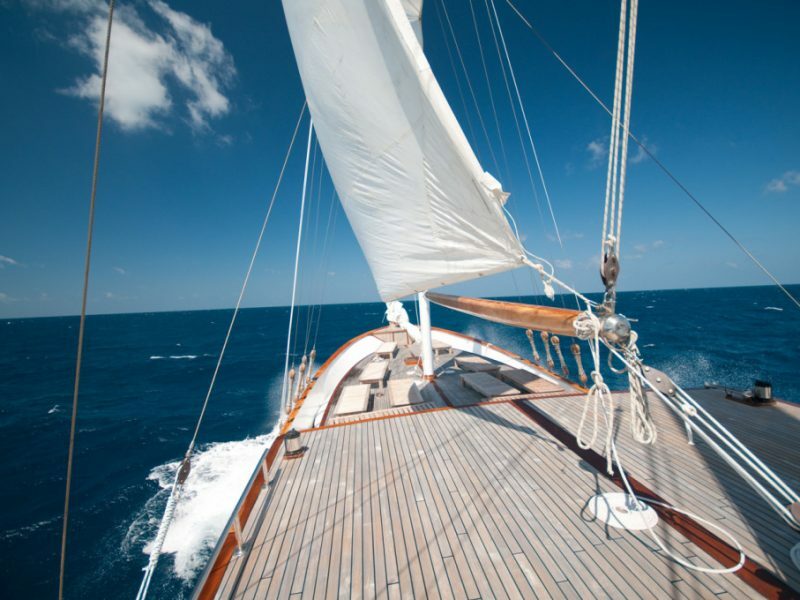 Posted on May 27, 2015 at 12:56 pm. 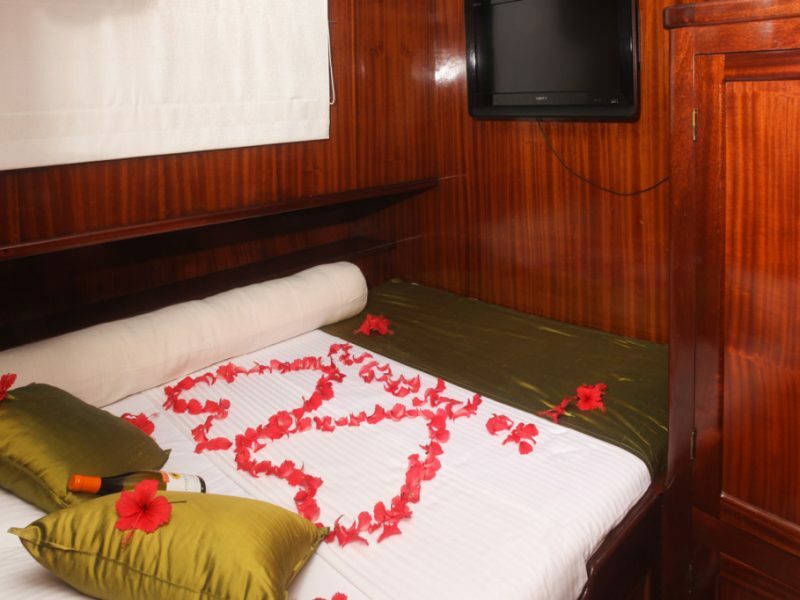 Black Pearl comes with air conditioned seven cabins ensuite bathroom and one double bed plus one single bed. 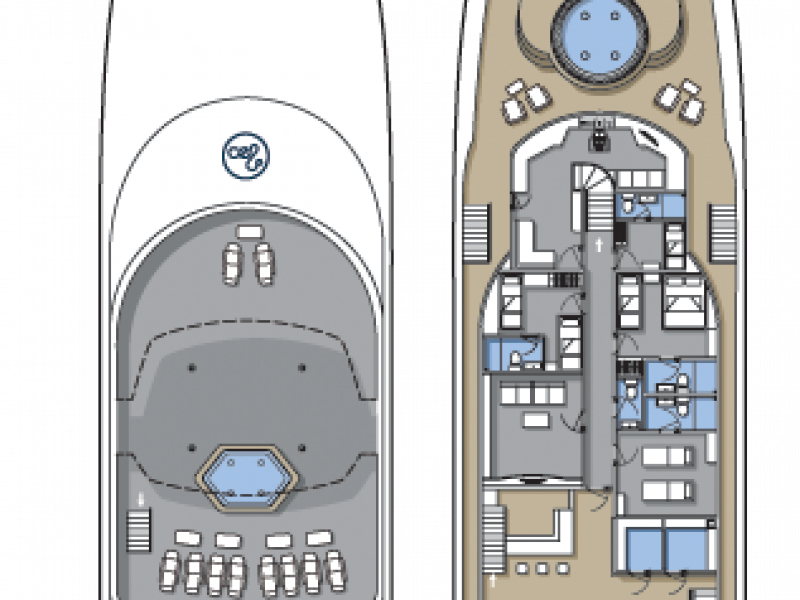 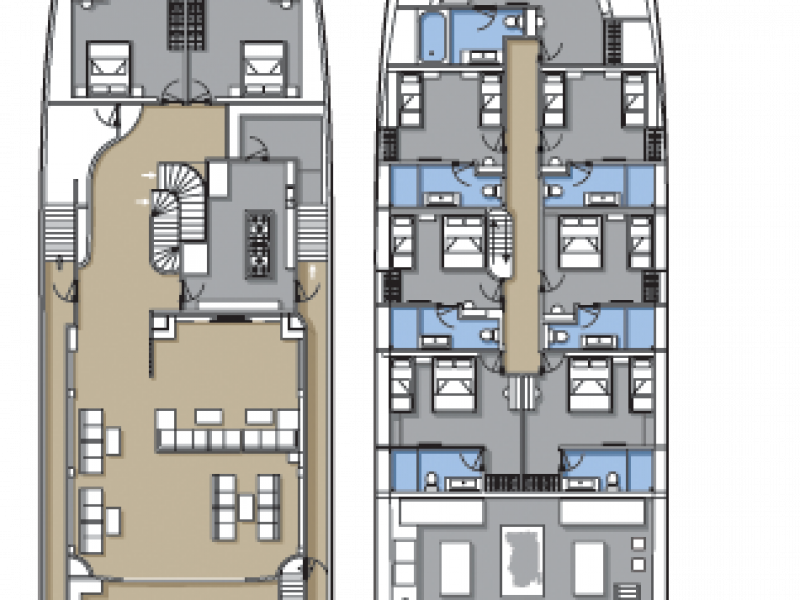 This cruise ship can has occupancy of 14 guests. 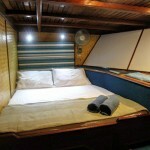 The boat size is 29 meters long and 8 meters wide. 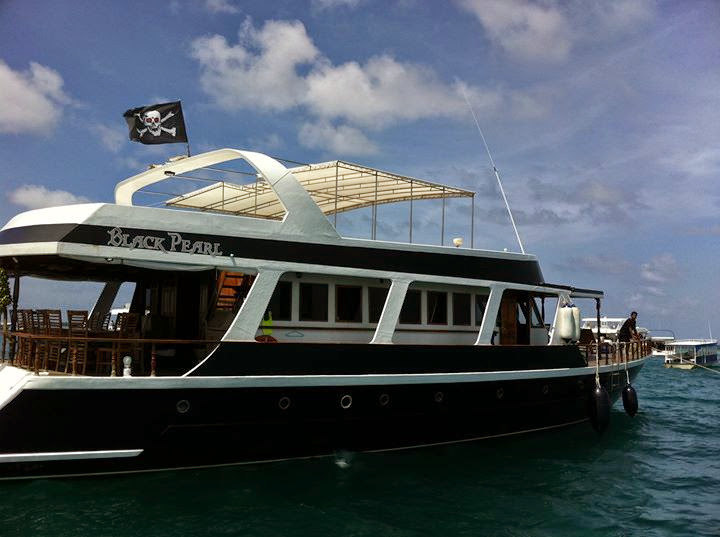 Black Pearl is frequently preferred for surfing trips. 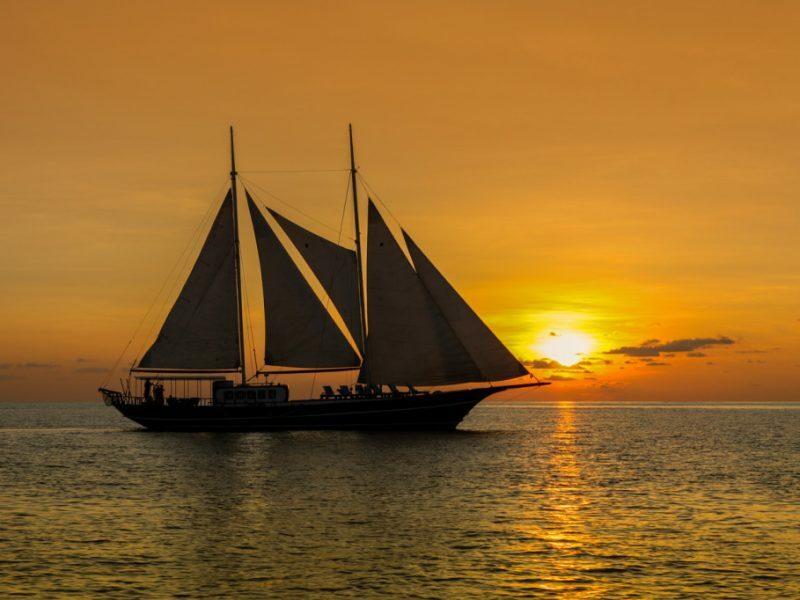 Posted on May 27, 2015 at 12:05 pm. 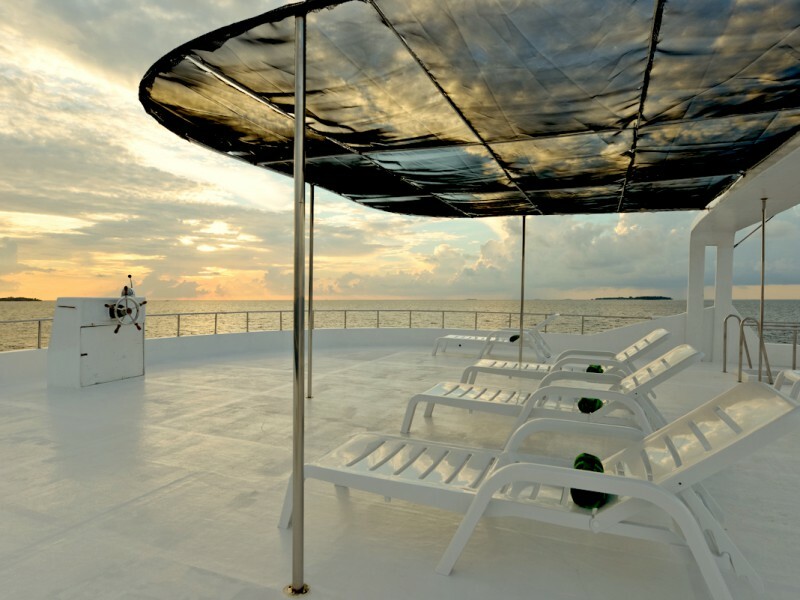 A romantic cruise along the world’s best beaches promises to dazzle your senses. 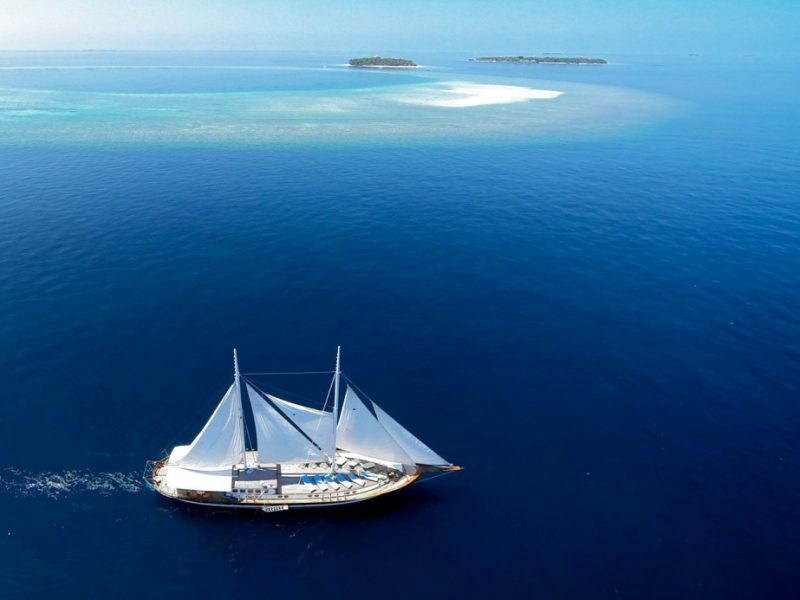 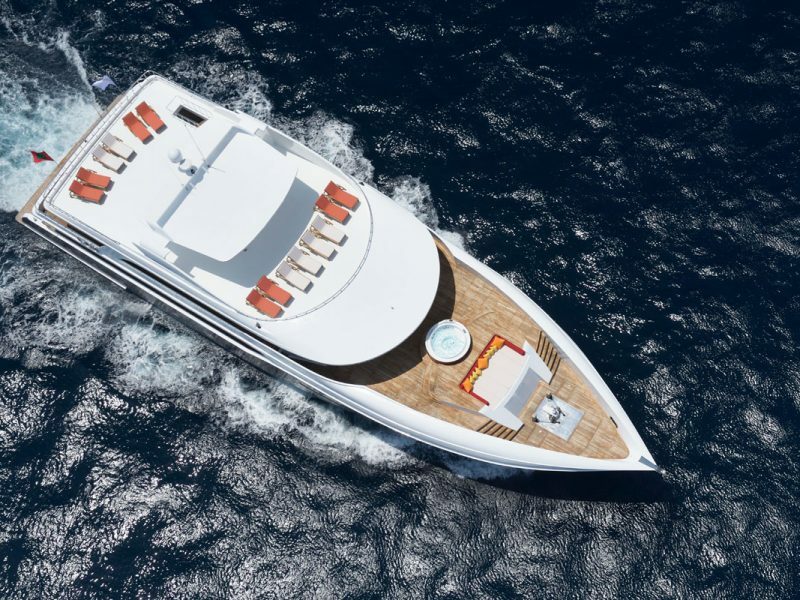 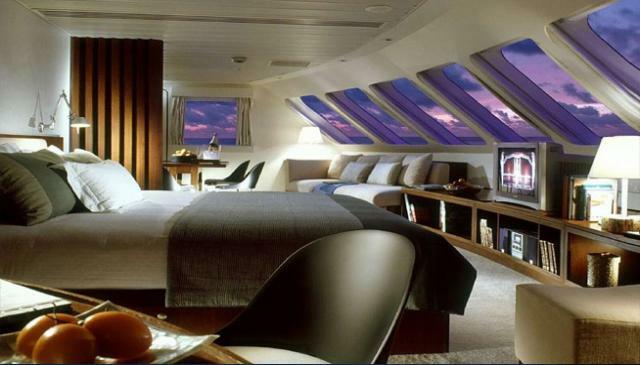 Four Seasons Explorer, a first class getaway floating resort in the Indian Ocean is the ultimate escapism. 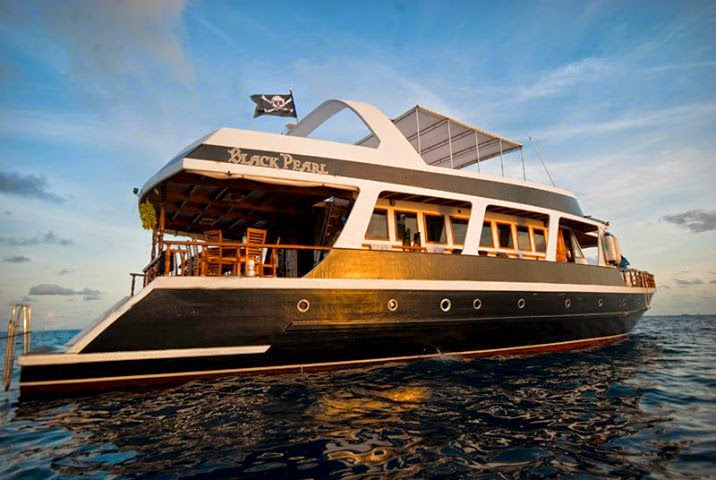 Travel on this floating paradise to discover a world of wonder, above and under the sea. 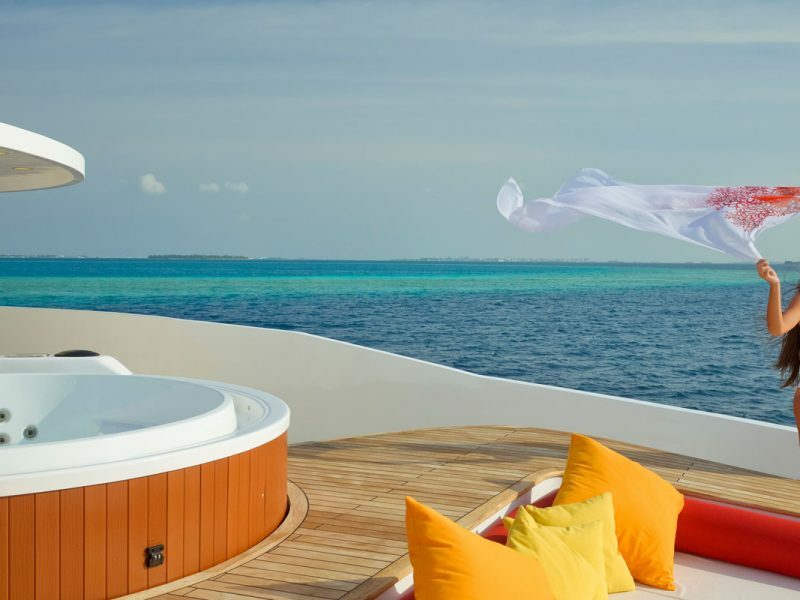 Four Seasons Explorer invites you to get the most out of your vacation in the Maldives, create experiences filled with adventures, invigorate and inspire you with the warm tropical breeze, rustling palm leaves and lapping waves beckoning you to relax and let go. 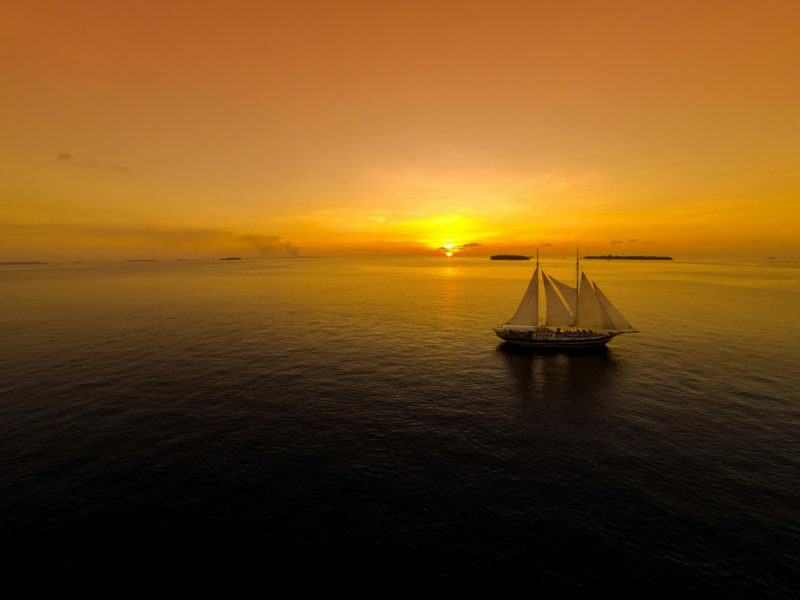 Posted on May 27, 2015 at 11:15 am. 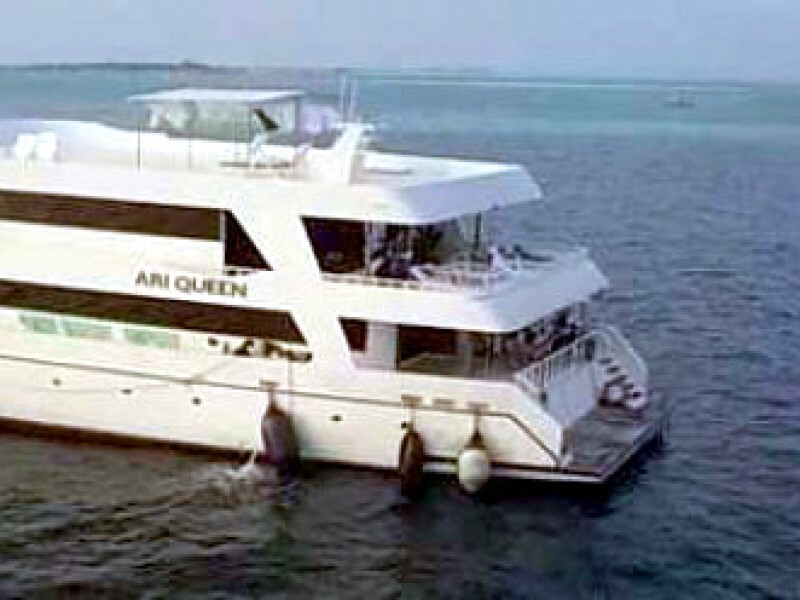 Ari Queen started its operation early 2009 and has been renovated recently. 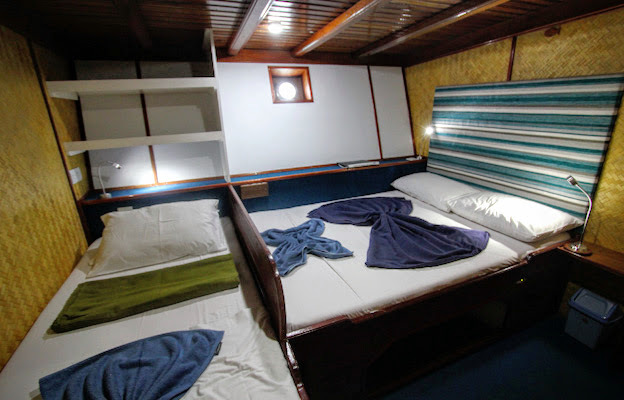 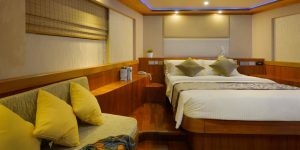 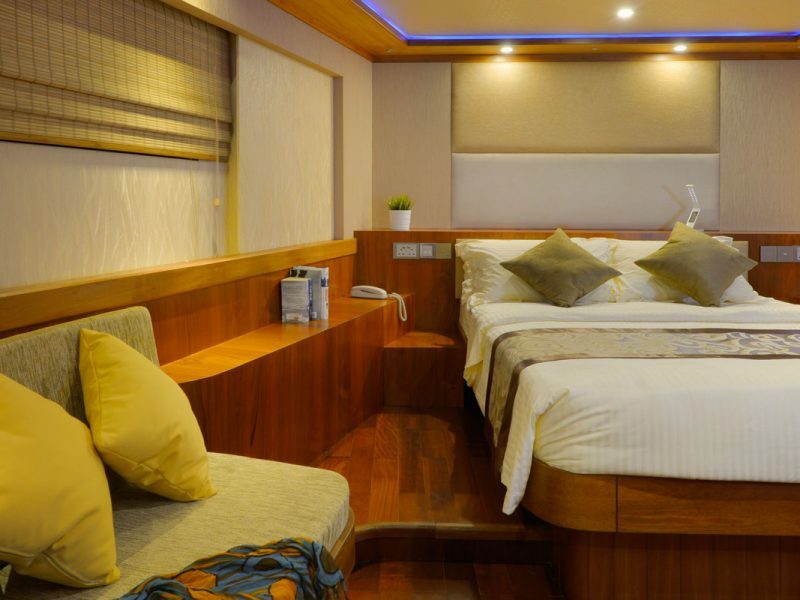 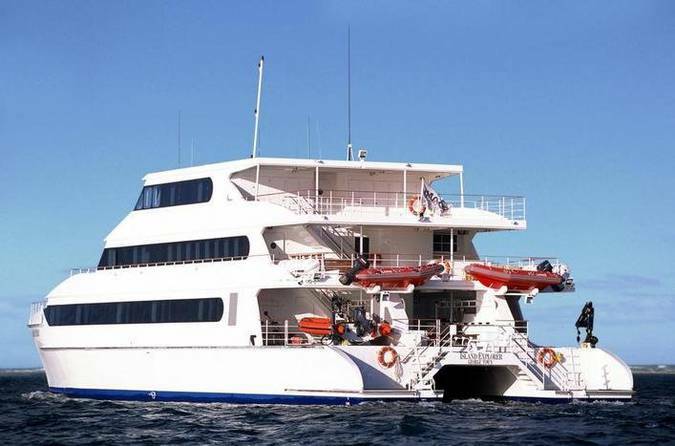 This spacious and comfortable vessel of its size accommodating 20 divers, in 10 air conditioned cabins (ensuite), flat screen TV (32”), fridge and other amenities. 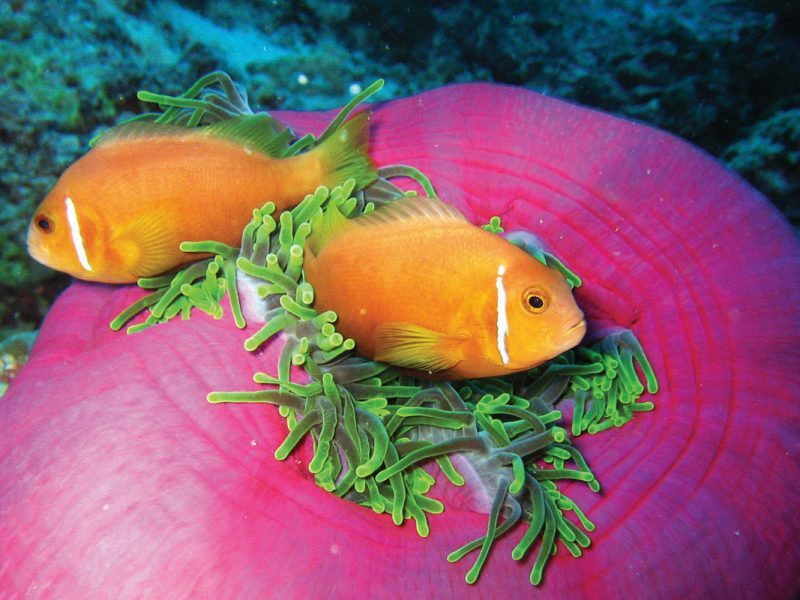 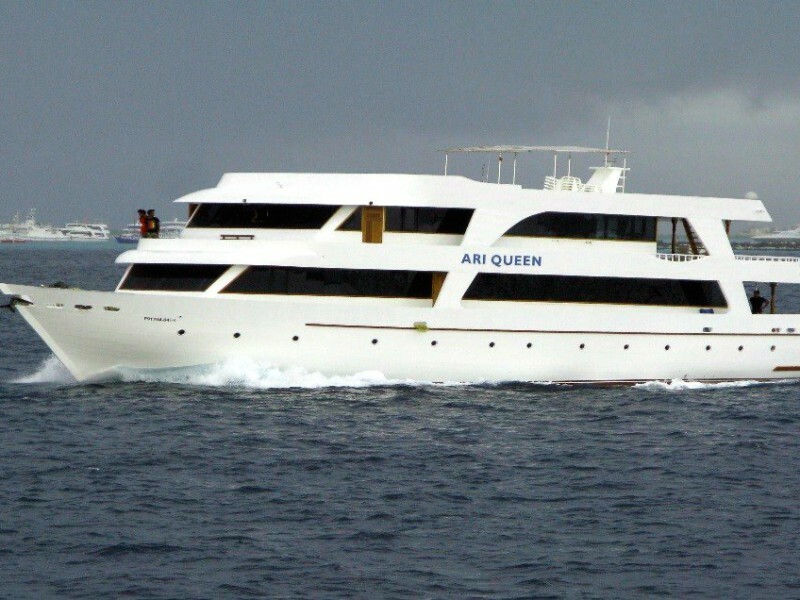 Ari Queen operates around dive sites in the central Maldives atolls. 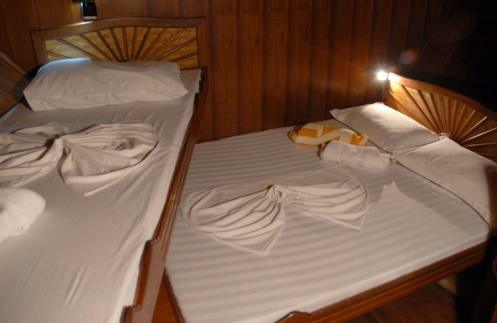 Towels are changed twice weekly and bed linen once mid-week.